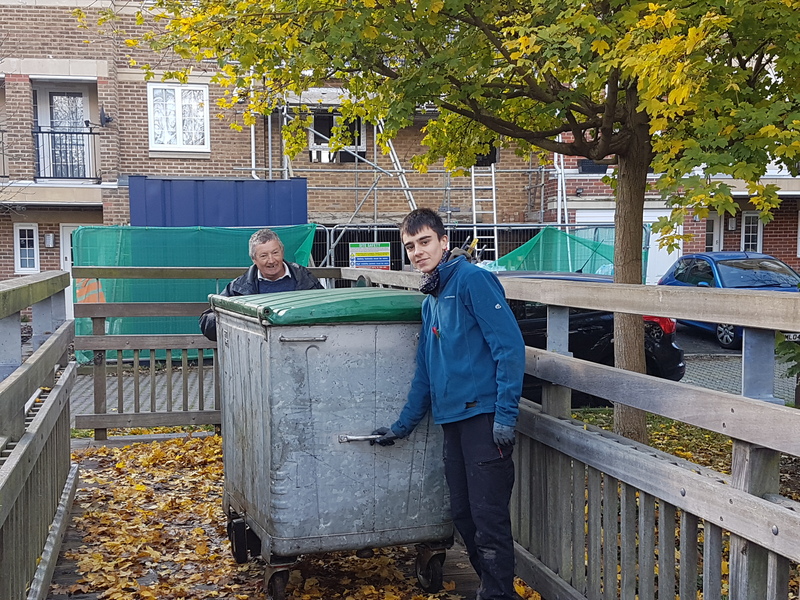 On a cold November morning, I arrived at North Road, Wimbledon to set up for this month’s Wandle cleanup. As I was unloading the van with a couple of helpers, a police car pulled up. Although we knew we’d done nothing wrong, we were slightly nervous as they approached. 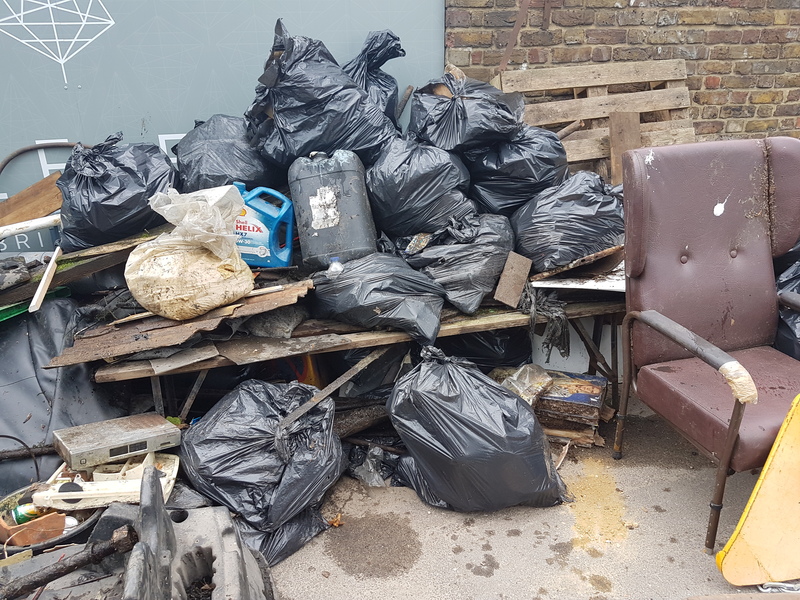 It turned out that someone had reported fly-tipping from a Zip Van, and the police had come to check it out, only to find the Wandle Trust setting up our event to tackle fly-tipping. 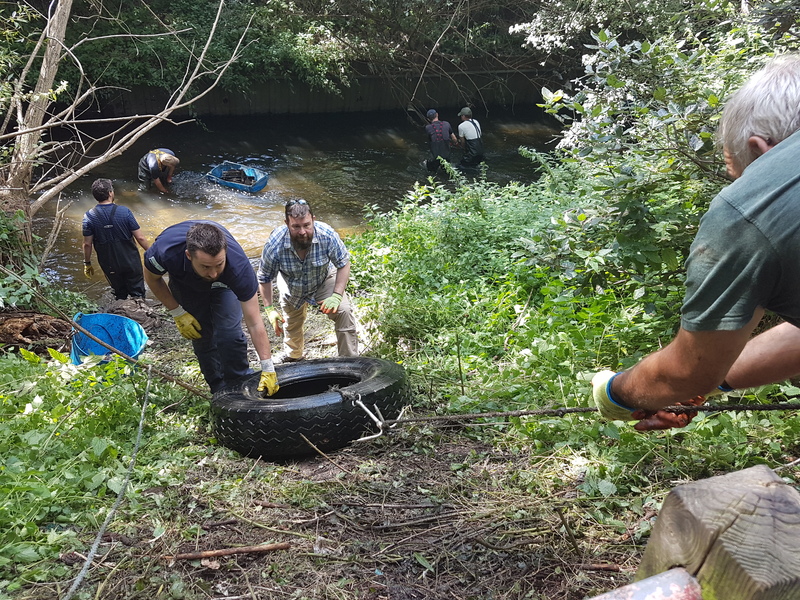 So that was ironic – but if you’re reading this, and you were the person who made that call – thank you for caring so much about keeping the Wandle Valley clean, and don’t stop making those calls if you see anything suspicious! With that all sorted, and no one arrested, I gathered our 45 volunteers to take a two minute silence for Remembrance Sunday, and then got our cleanup started. This is the first event supported by the Tesco Bags of Help Fund which offers community groups and projects across the UK a share of revenue generated from the 5p charge levied on single-use carrier bags. To get started, we headed down to the footbridge by Garfield Recreation Park and got in to the Wandle to work upstream. The water was much deeper than usual, with poor visibility. 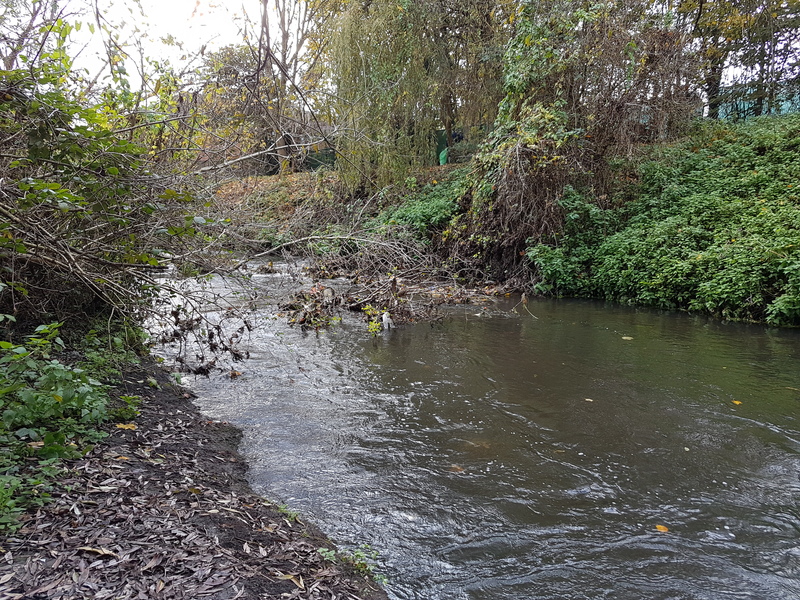 This was due to heavy rainfall overnight, and some natural woody material which had fallen in the river, creating some excellent new habitats for fish in what was previously quite a straight, uniform channel. 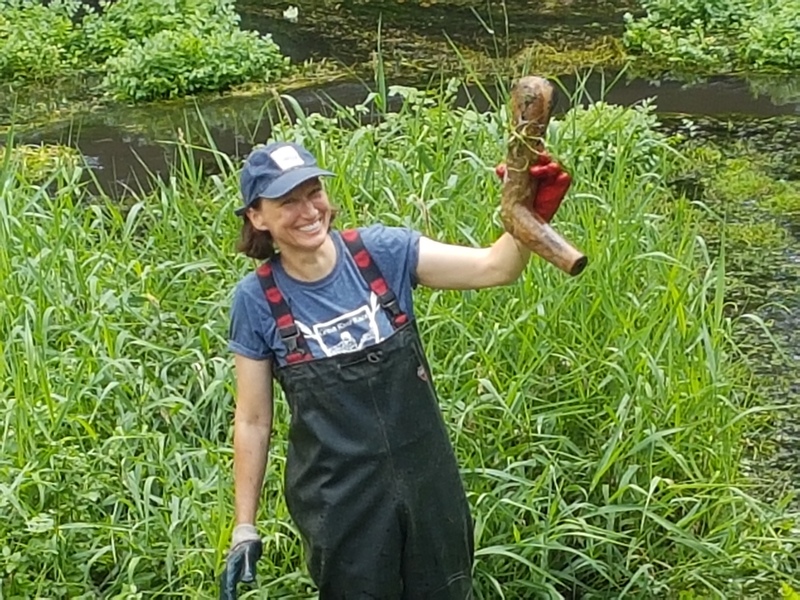 While we loved the new additions to the channel, it did make our event a bit harder, with logs and bits of tree to navigate over, and deeper water. In fact, in some places it was so deep we had to get out and walk along the bank until the level had dropped. 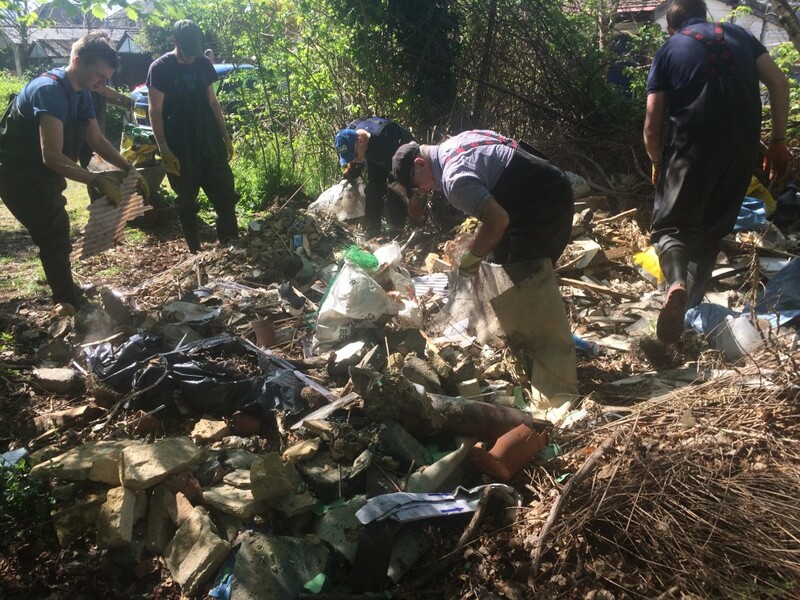 Despite the additional challenges, rubbish was found. 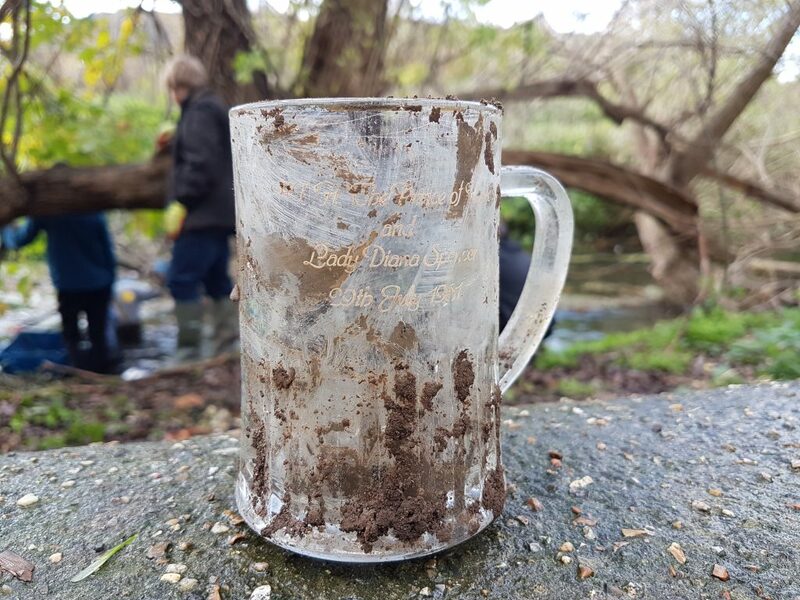 We cleared 15 bags of plastic bottles which had accumulated near one tree trunk..
We also found this commemorative mug from Prince Charles and Princess Diana’s wedding. By lunch time we were freezing and headed back to the tent for tea and cakes, as well as some delicious savoury snacks made for us by the students from the Richmond International University. However, we didn’t stop for long as the weather wasn’t getting any warmer and it was better to be moving than standing still. 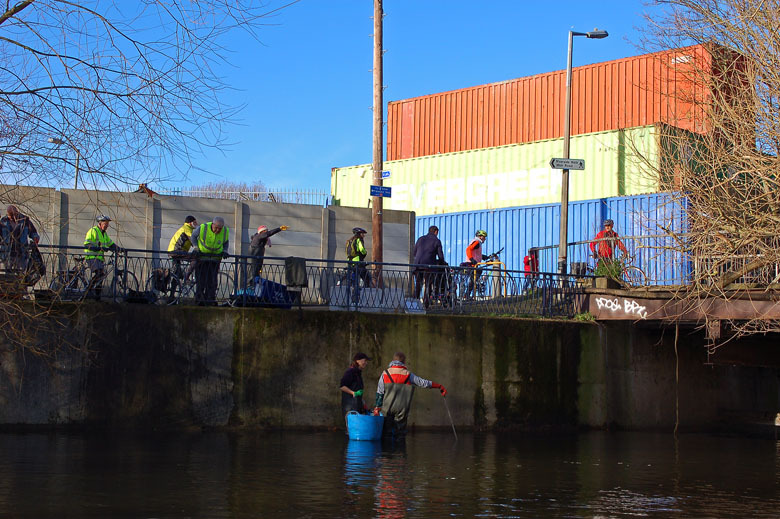 With 500 m of the Wandle covered in this cleanup, we called it a day and all went home to defrost. So what did we find? 1 carved pumpkin, 1 green pepper, 1 step ladder, 1 computer chair, 1 Vishnu statue, 1 Prince Charles & Princess Diana mug, 1 piece of guttering, 1 shopping basket, 1 bicycle, 1 tyre, 1 bike wheel, 1 wheelchair, 1 mattress, 1 duvet, 1 Merton Council waste bin, 1 sofa, 2 wooden pallets, 10 coconuts, 15 tennis balls, 15 bags of plastic bottles and bags and bags of other junk. Huge thanks everyone who helped unpack and pack up the van during the event, Wally for supervising the Event Tent, the students from Richmond International University for baking such yummy treats and the Waste Team at Merton Council for organising collection of all the rubbish the next day, Big Yellow Wandsworth for providing free storage space for our equipment and to our funders, Tesco! 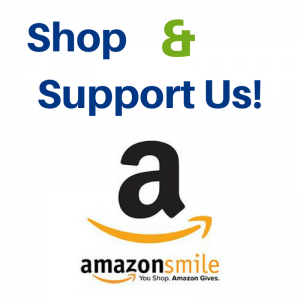 Thank you to all our volunteers for coming: Aaron, Alec, Andrew, Andy, Beth, Carl, Charles, Chris, Christine, Claire, Dave, David, Derek, Emily , Fahad, George, Guy, Hayley, Ian, James L, James T, Jayne, Joe, John, Kai, Karoline, Korab, Lisa, Michael D, Michael O, Mickeif, Nick, Per, Phil R, Phil S, Rolanas, Sheila, Steve, Stewart, Thea, Thomas, Wally, Wayne and Will. 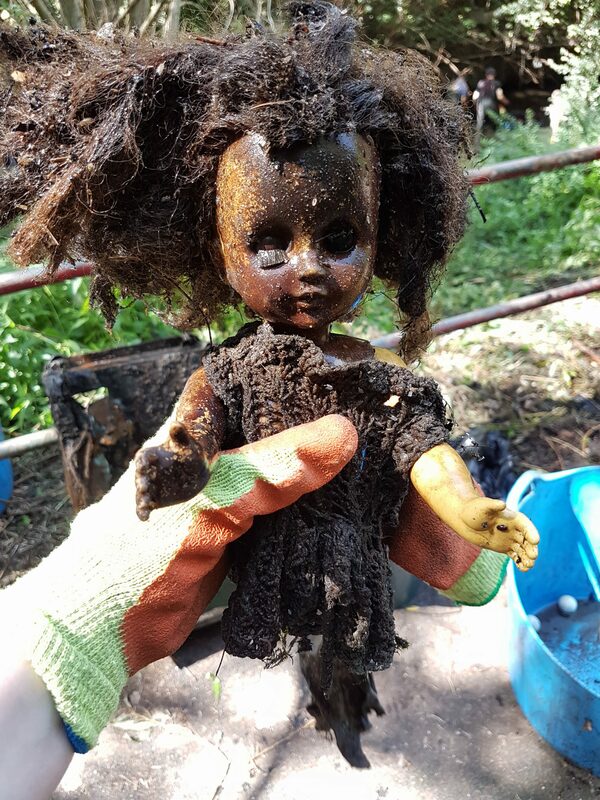 This entry was posted in Uncategorized and tagged Bags of Help, Cleanups, Events, Merton, People, Spreading the Wandle Word, Tesco, Volunteer, Wandle, Wombles of the Wandle on November 20, 2017 by Polly. For October we headed to Wandsworth to tackle the Wandle through King George’s Park, and with 48 people joining us, we were fairly sure we would be finishing the day with a very large rubbish pile. The cleanup this month was part of a much wider campaign to raise awareness of the amount of plastic and rubbish found in our rivers, and consequently the ocean: The Great River Rescue. 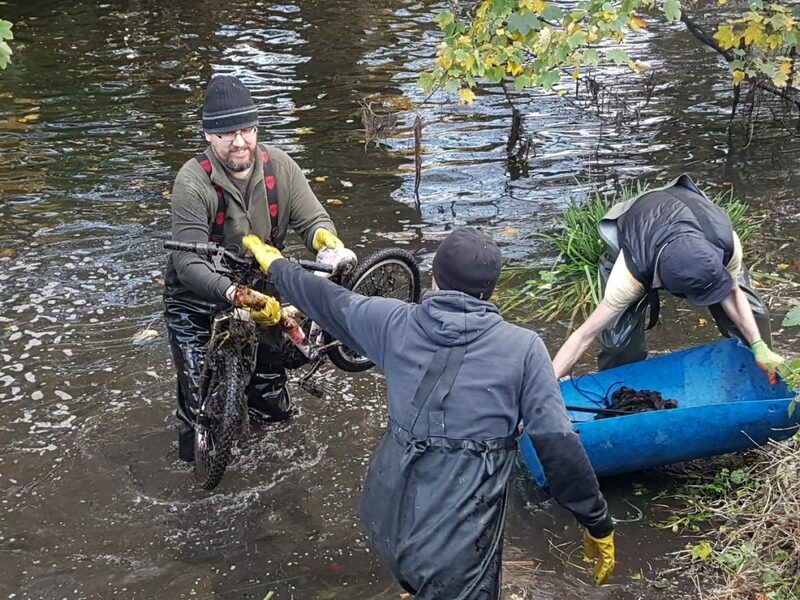 The campaign has been organised by environmental charity Thames21, The Rivers Trust, the Marine Conservation Society, the Angling Trust and the Canal and River Trust. 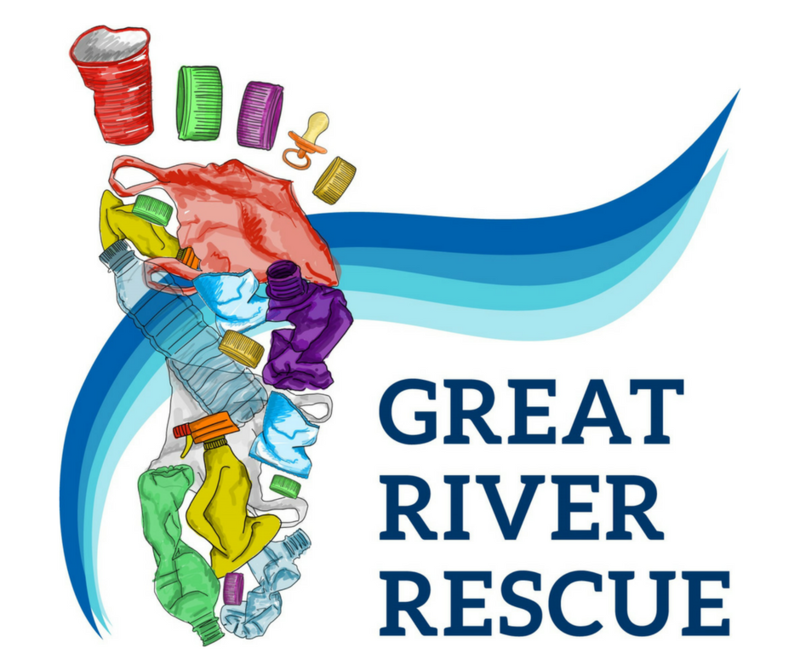 The campaign was inspired by Future Dust, a large-scale artwork by Maria Arceo in the shape of a giant plastic footprint commissioned as part of Totally Thames, the September-long annual celebration of the River Thames. The installation will tour to different riverside locations across London. To find out more about the campaign and Future Dust, visit here. After the Health & Safety talk, we divided up in to 3 teams: wading, bank support and litter pickers. 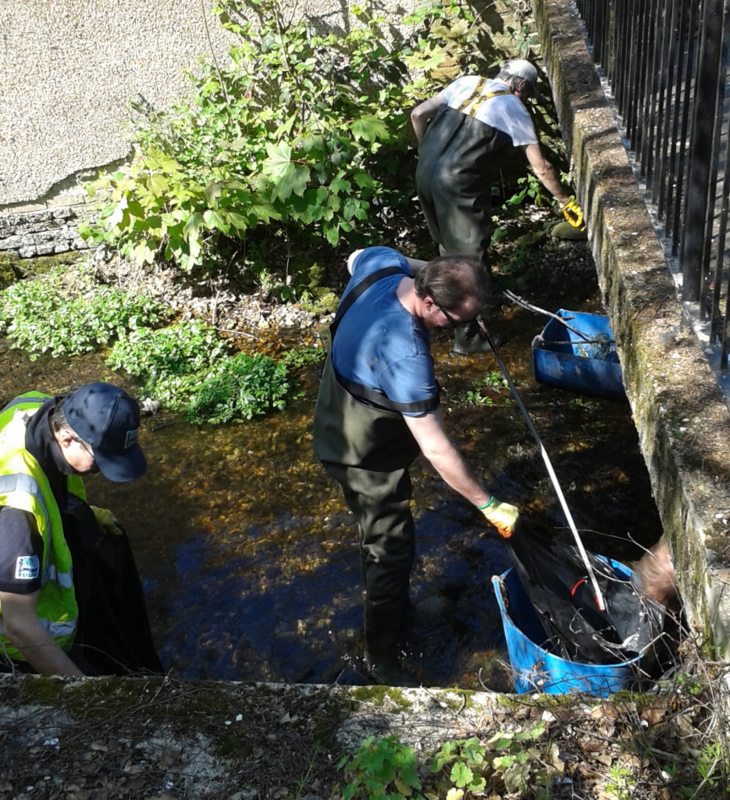 The wading team got in the Wandle just upstream of the Lydden Road pedestrian bridge and from there headed upstream. In no time at all, rubbish was flying out of the river and the day began. 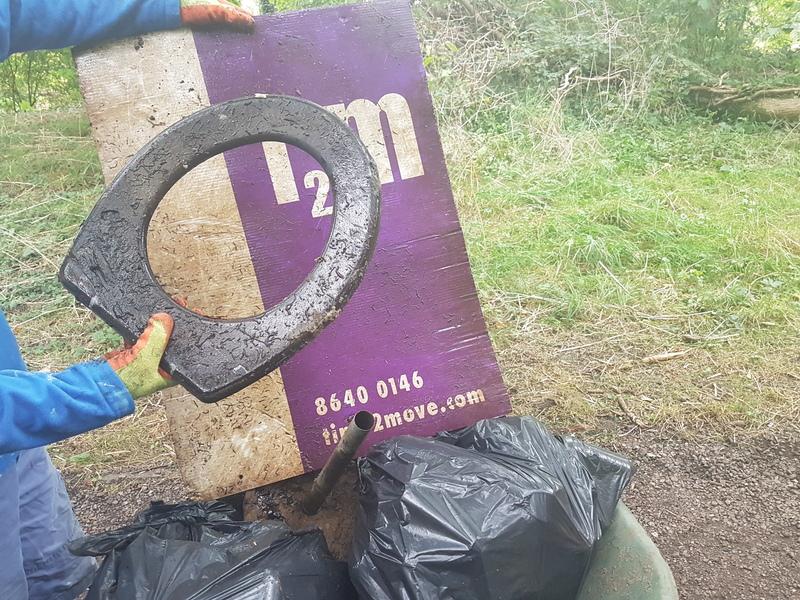 We were joined by two new volunteers who can come armed with powerful magnets on the end of rope – using them to fish out metals from the river! I don’t know whether it was thanks to these magnets, or a coincidence, but we found a lot of random bits of metal on the river this time. 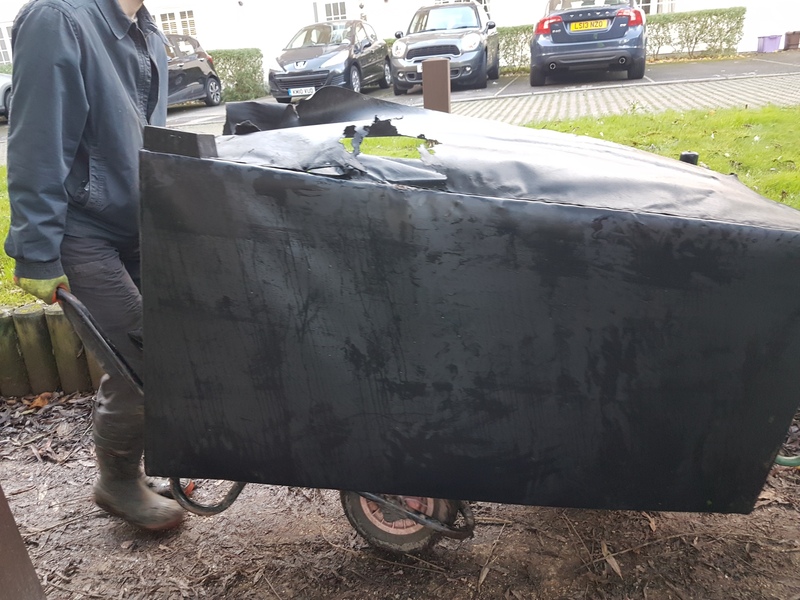 And trug after trug of plastic rubbish was pulled from the river, put in bags and carried to the dump site. By lunch time, the rubbish pile was taking shape and we were all ready for a sit down and a cup of tea. A huge thanks to Leah and the other students for baking such lovely treats for everyone. So what did we find? 1 pet cage, 1 coconut, 1 road sign, 1 badminton racket, 1 kids car, 1 bike tyre, 1 car bumper, 1 elephant mask, 1 safe, 1 shopping basket, 1 tyre swing, 1 plastic table, 1 empty drill box, 1 traffic cone, 1 shopping trolley, 1 bicycle, 10 tyres, 40 metal poles and 80 bags of other rubbish. Huge thanks everyone who helped unpack and pack up the van during the event, Rosie for supervising the Event Tent and for helping me back at the garage, the students for baking such yummy treats, Big Yellow Wandsworth for providing free storage space for our equipment and the Waste Team at Wandsworth Council for organising collection of all the rubbish the next day. Thank you to all our volunteers for coming: Aaron, Adam, Andy, Charles, Chiara, Chris, Chris, Christine, Connor, Dave J, Dave W, David H, David S, Derek, Emily, Geoffrey, Gideon, Guy, Jane, Joe, John L, John N, Leah, Lisa, Luke, Lynda, Marcus, Mark, Martina, Megan, Mohamad, Naah, Pamela, Penny, Per, Phil, Raphael, Robert, Rose, Ruby, Steve , Tom, Tony, Wally, Wayne and Will. So what did I learn from this month’s cleanup? Be quick so I don’t miss out on cake! 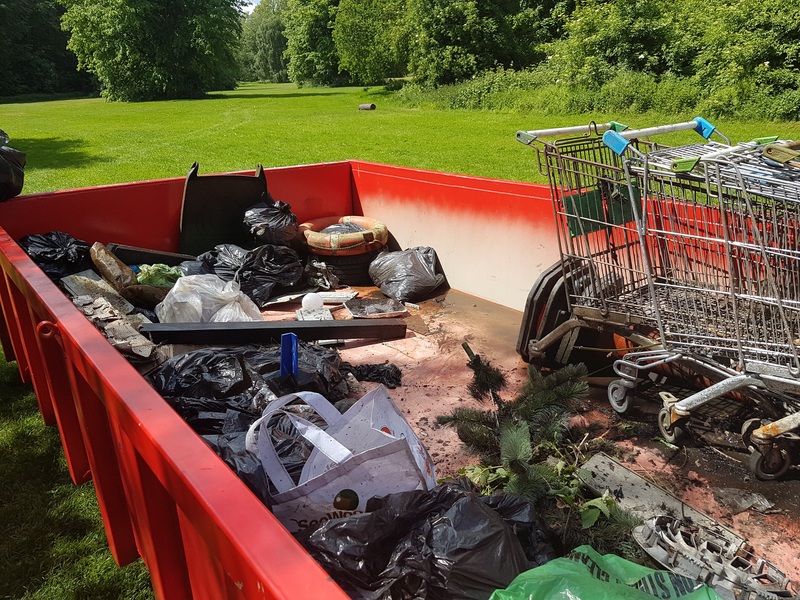 This entry was posted in Uncategorized and tagged Cleanups, Events, Great River Rescue, King Georges Park, People, Spreading the Wandle Word, Volunteer, Wandle, Wandsworth on October 30, 2017 by Polly. 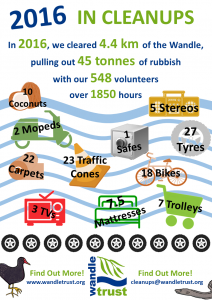 While it is fun to have a monthly cleanup with a mammoth pile of rubbish at the end of it, it is also nice to know in some places we are making a real difference. 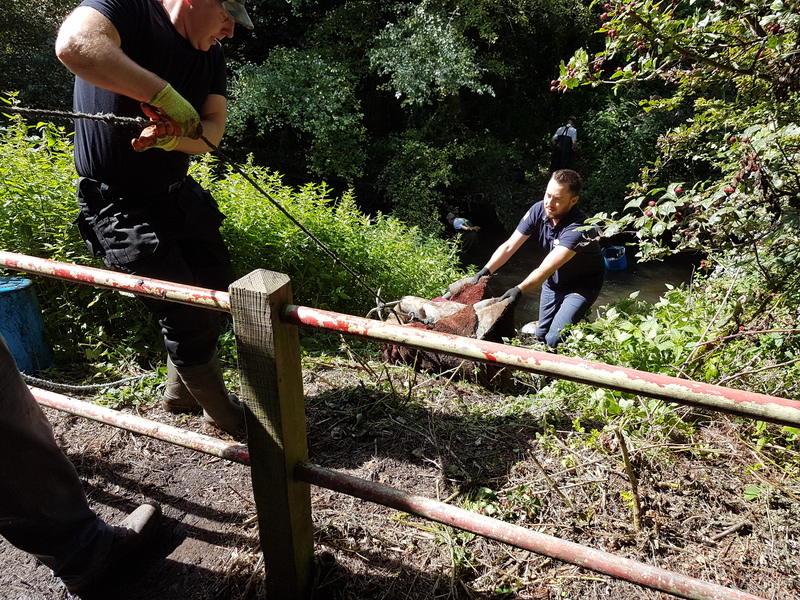 Yesterday, at Ravensbury Park, we saw just that – our work had made a difference. We gathered in the park at 11am with 80+ people (regular volunteers, new faces, Friends of Ravensbury Park, 13th Wimbledon Scouts and Richmond University) and hatched a plan of what we could tackle as a team. 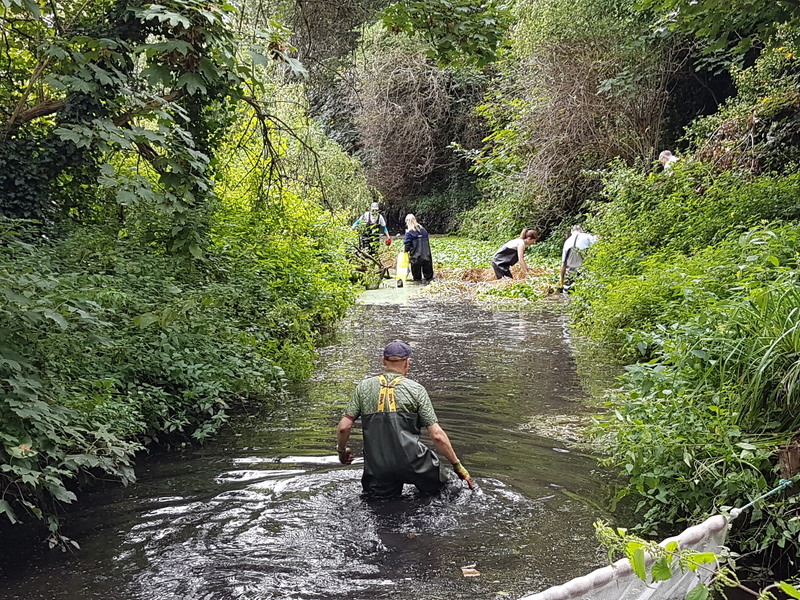 Two wading teams departed, 1 to clear rubbish from the Wandle and the other to tackle the floating pennywort in Ravensbury Park Lake and adjoining back channel. 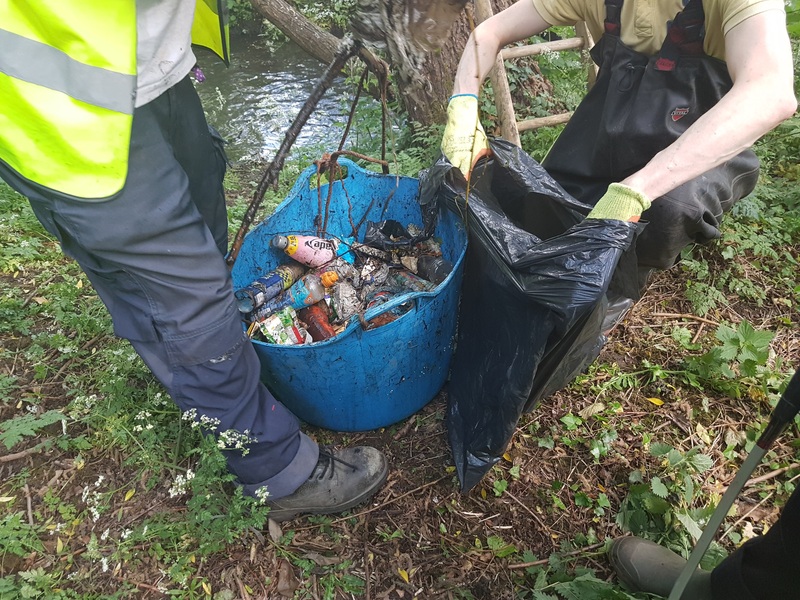 The river team were accompanied by a strong bank team as it was a long way back to the rubbish pile (600 m) and everyone else grabbed a litter picker and went to spruce up the park. And with that, 80 people went to work! The pennywort team focused on the lake and back channel. 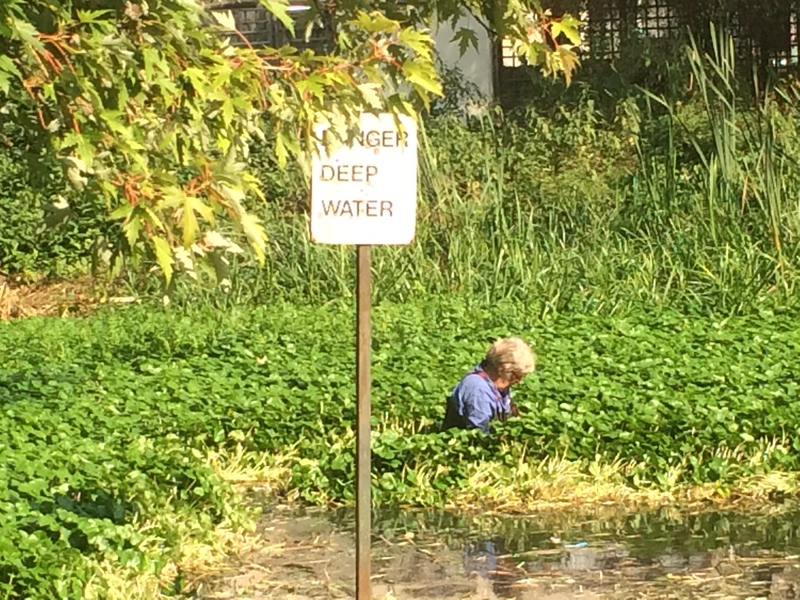 For the past 10 + years, Ravensbury Park Lake has been smothered by pennywort, and each September we have helped the friends of group clear it, for it only to grow again. But the end is finally in sight. 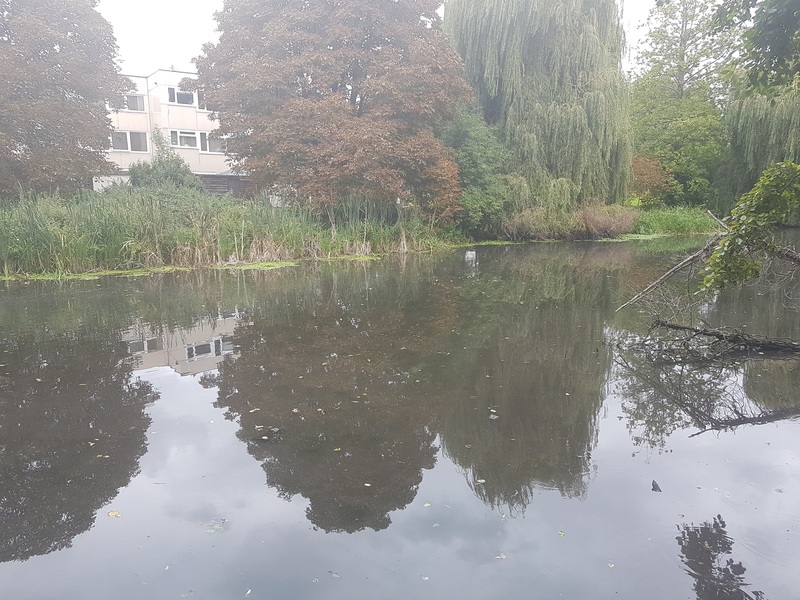 Our Wandle INNS Project has been working over the last year on the site to properly clear the lake and when we returned on Sunday, the lake was open water, with small patches of pennywort at the side. Perfect! We asked a team of 6 volunteers to wade into the lake and remove these small patches. Meanwhile, another team tackled the back channel downstream of the lake which was still smothered. Once a net was in place downstream, this pennywort was removed by hand and the channel was free once more. Success! While this was going on, our river team were making quick progress in the main channel. 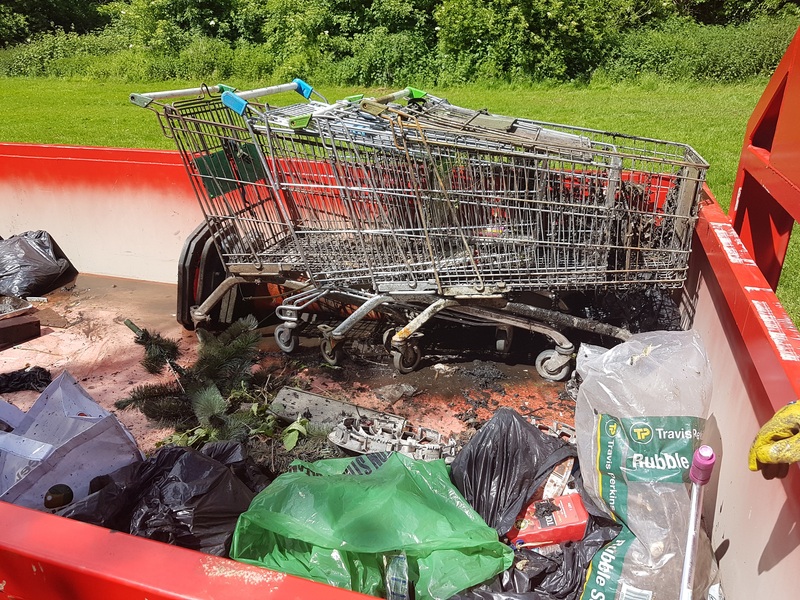 It wasn’t like some of our events where trolleys and washing machines are flying out of the river, but that didn’t mean there was no rubbish at all. We found tyres, toilet seats and for sale signs..
And lots of other junk and rubbish. 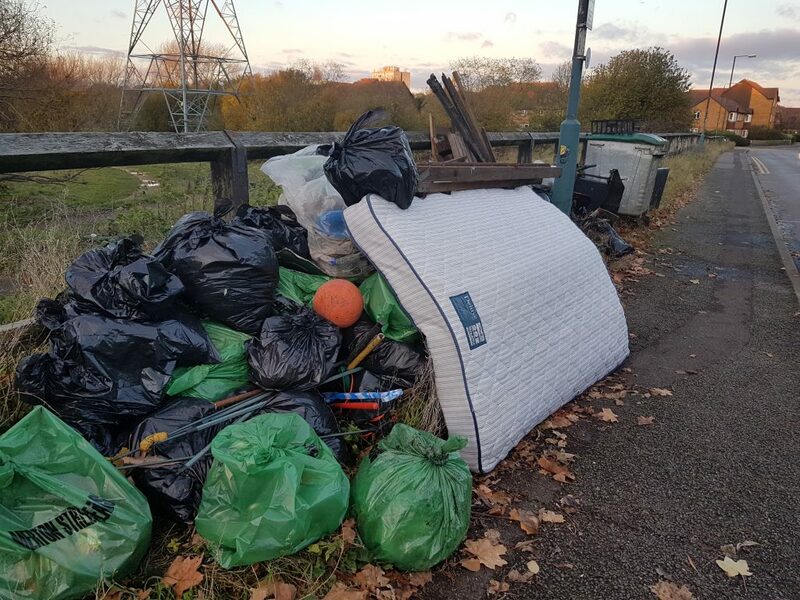 The mattress was in Ravensbury Park Lake – a site which hasn’t been checked for rubbish over the last 10 years as it has been full of pennywort. But with that under control, Andy discovered a very old mattress that was full of silt and extremely heavy. 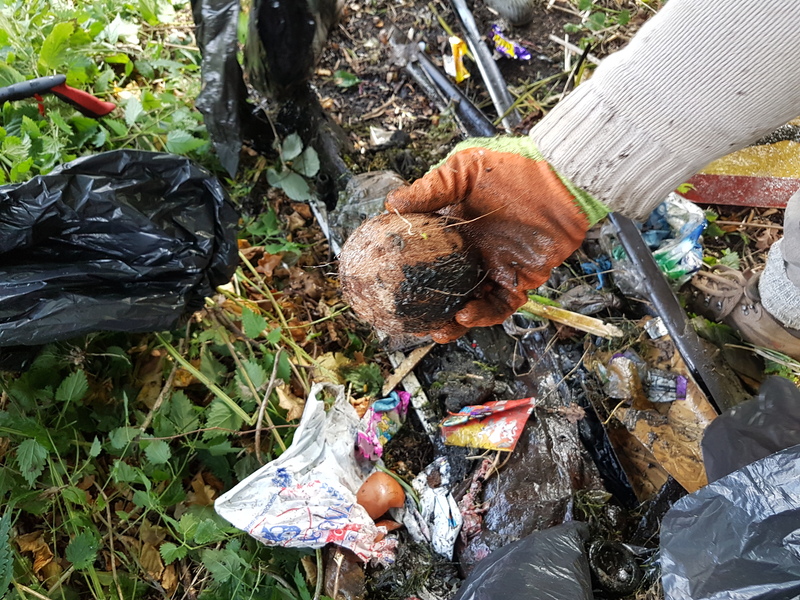 It took a lot of people to pull it on to the bank, and then we had to divide it in to smaller chunks to transport all the way to the rubbish pile. After that excitement, everyone was ready for a break and so we stopped for tea and coffee. 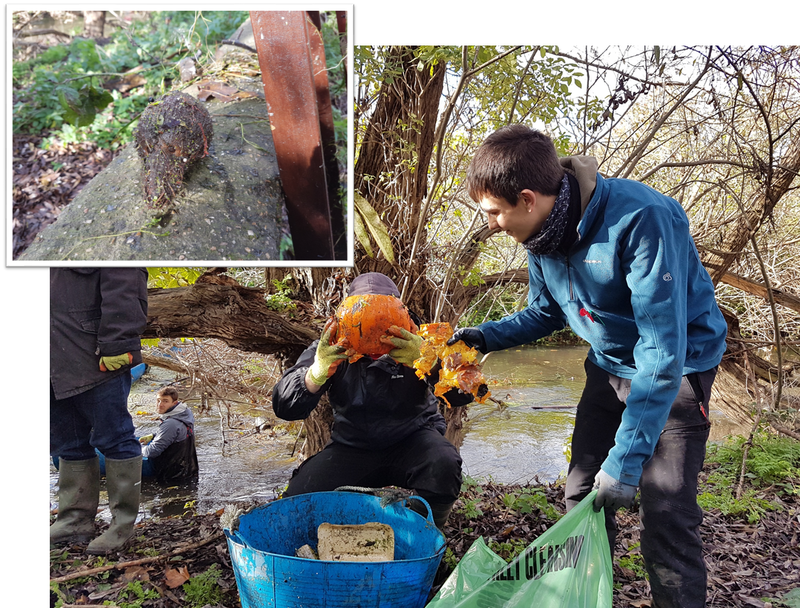 With the pennywort sorted, the river cleared and the park litter-picked, we had a slightly longer lunch break than usual and then called it a day well spent! So what did we find? 1 silty, sodden mattress, 1 bike, 1 lawnmower cover, 1 toilet seat, 1 plastic chair, 1 Christmas tree, 1 ride-along car, 1 scooter, 1 laundry basket, 1 dustbin, 2 for sale signs, 3 plastic boxes, 4 sofa cushions, 7 tyres, a channel of floating pennywort and bags and bags of other rubbish. Huge thanks everyone who helped unpack and pack up the van during the event, Rosie for supervising the Event Tent and for helping me back at the garage, Friends of Ravensbury Park for joining us for the joint event, Big Yellow Wandsworth for providing free storage space for our equipment and the Waste Team at Merton Council for organising collection of all the rubbish the next day. Thank you to all our volunteers for coming: Aarti, Andy, Bonnie, Charles, Chris, Claire, Cohhot, Daniel, Dave , David , Derek, Freya, Geoff, Gideon, Gurnoor, Guy, Hannah, Henrik, Ian, Jackie, Jane, Joe, John B, John C, Jordyn, Juan, Julian, Lorenzo, Lukas, Lyn, Martina, Mickey, Miriah, Nick, Paola, Paul, Per, Phil, Piero, Priya, Rob, Rolanas, Rose, Saihal, Sam, Sarah, Scott, Sheila, Spencer, Steve, Stewart, Valerie, Wally, Wayne, Will D and Will W. Plus 30+ 13th Wimbledon Scouts! So what did I learn from this month’s cleanup? 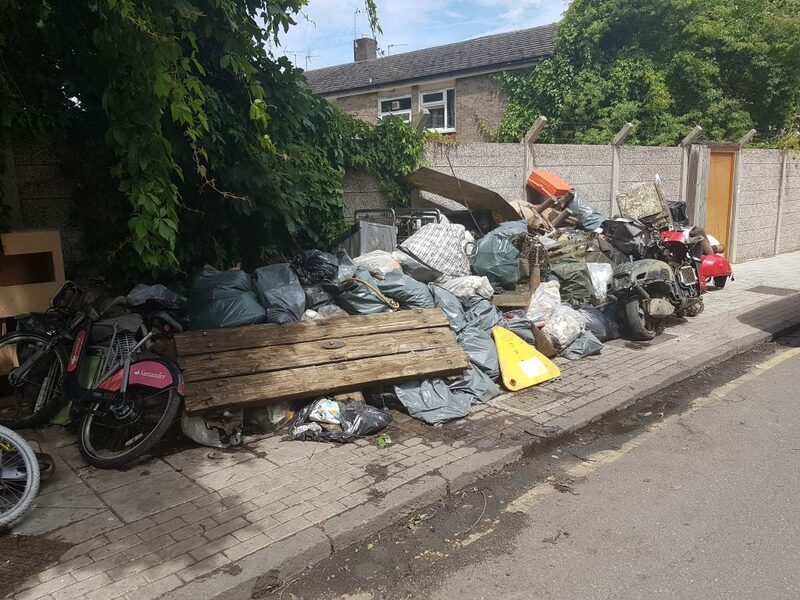 We are slowly winning the battle against fly tipping! 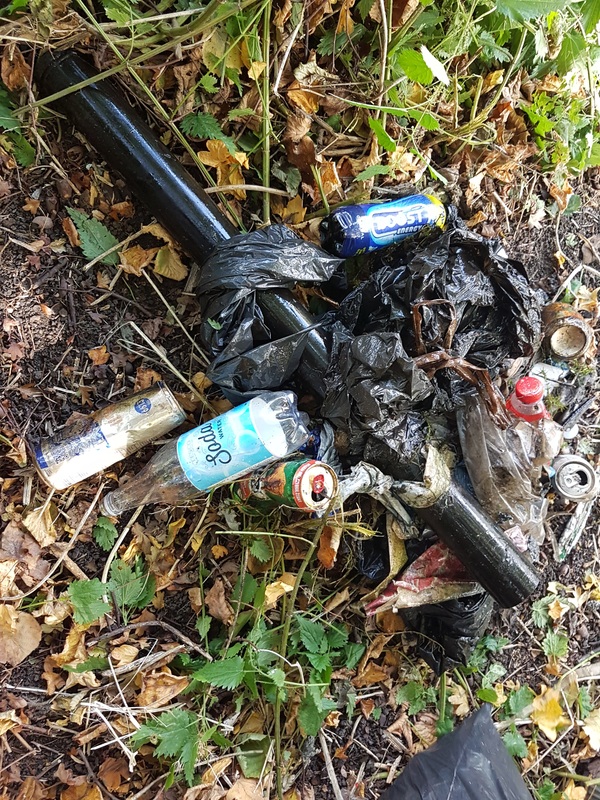 This entry was posted in Uncategorized and tagged Cleanups, Events, INNS, invasive species, Ravensbury Park, Spreading the Wandle Word, Volunteer, Wandle on September 25, 2017 by Polly. August saw us return to Waterside Way in Wimbledon. 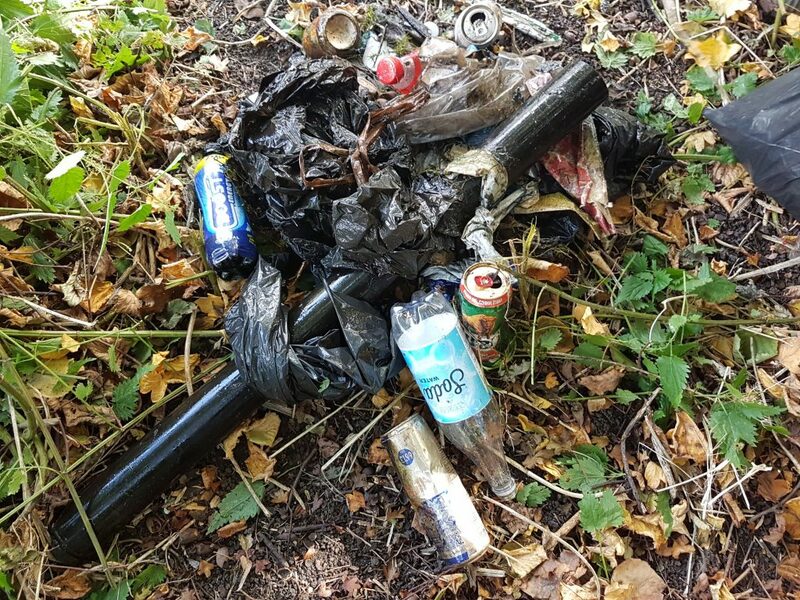 This site is still full of rubbish and will be a regular site for some time to come considering how little distance we manage to cover each time. 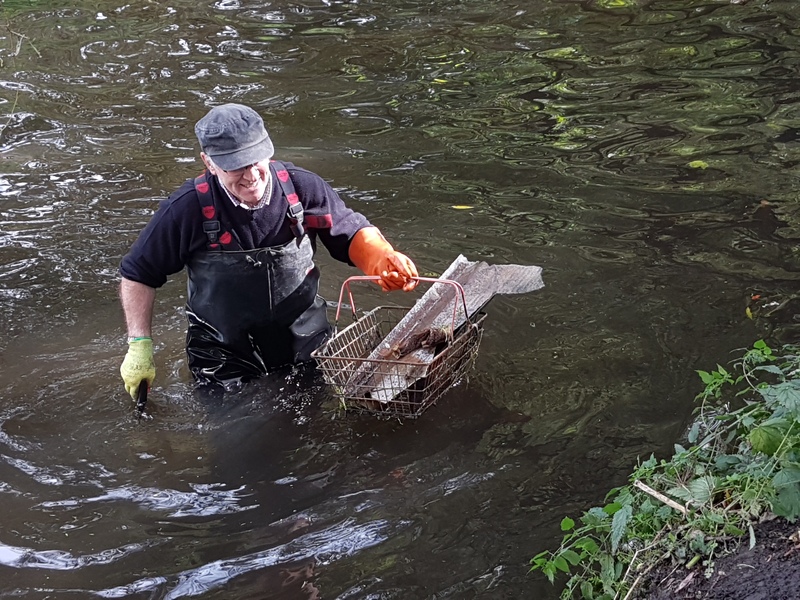 We were joined this month by Nick Hale, another Wandle Trust Project Officer who came along to experience our famous cleanups. After the usual health and safety briefing, we got stuck in. The waders got in the river just upstream of where we finished back in March. As they filled their first trug load, my team on the bank were getting bored, waiting for something to do. I suggested they enjoyed the peace while it lasted – this was Waterside Way, after all! And like clockwork, trug after trug was filled and the bank team soon missed the easy start they had. The first large find was a lorry/bus tyre, shortly followed by 5 other car tyres. Next, a bicycle was found. 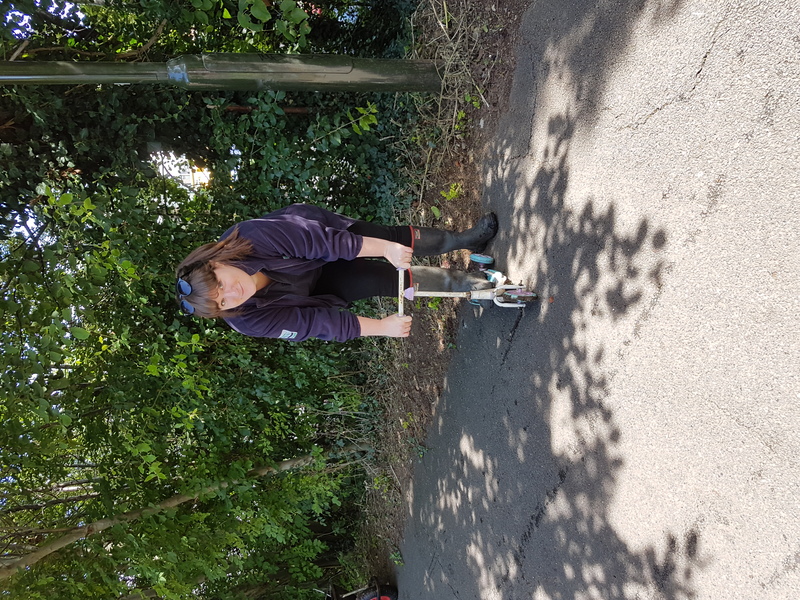 Not in great condition, but as Nick still doesn’t have a bike for his London to Brighton cycle ride (raising money for the Wandle, you can sponsor him here), it might be the best he’s gonna get! 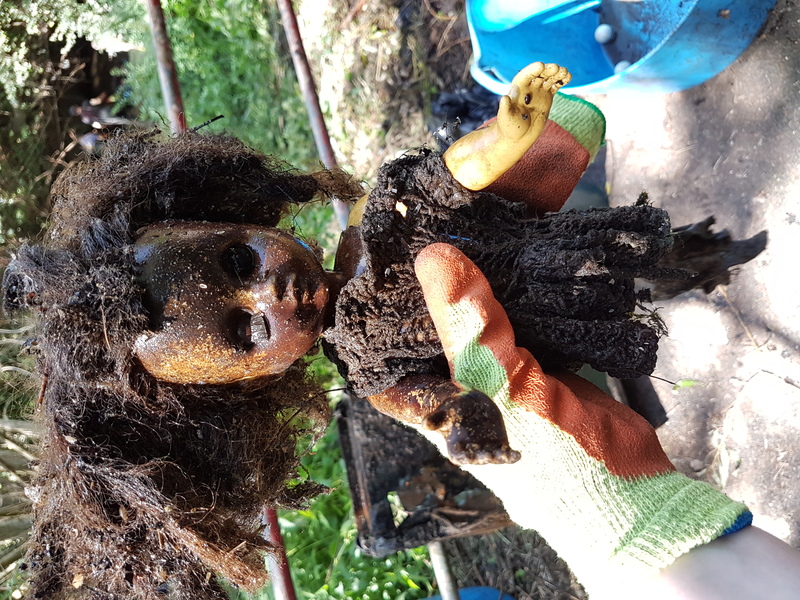 A few minutes later, I was given perhaps the creepiest gift from the Wandle yet – this doll. After a quick lunch break, we moved further upstream, but only by 10 or so metres. Here we found the classic coconut. And some large carpets which were extremely heavy as we pulled them up the bank. After 4 hours of hard work, we finally called it a day and packed up the van. So what did we find? 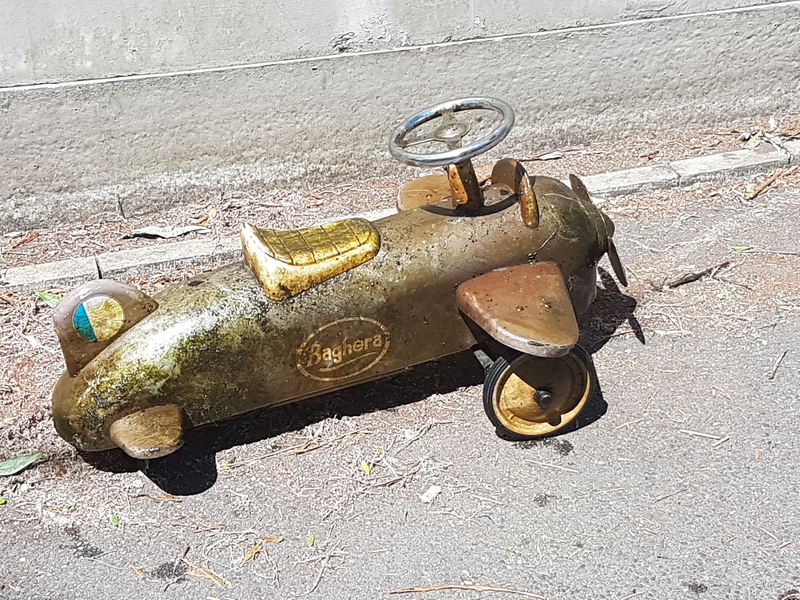 1 licence plate, 1 Frozen scooter, 1 road barrier, 1 moped pannier, 1 dashboard, 1 lighting rig, 1 bike, 1 creepy doll, 1 cassette tape, 1 lorry tyre, 1 traffic cone, 1 disposable BBQ, 2 coconuts, 2 stereos, 2 large carpets, 3 toy cars, 5 car mats, 5 tyres, lots and lots of miscellaneous fabric and bags and bags of other rubbish. Huge thanks everyone who helped unpack and pack up the van during the event, Rosie for supervising the Event Tent and for helping me and Nick back at the garage, Big Yellow Wandsworth for providing free storage space for our equipment and the Waste Team at Merton Council for organising collection of all the rubbish the next day. A a big thank you to all our volunteers for coming: Abdul, Andy, Beth, Carlos, Charles, Christine, Claire, David H, David S, Derek, Freya, Geoff, Gideon, Guy, Jane, Joanne, John N, Kathy, Keith, Lisa, Mark B, Melanie, Nick, Paul, Phil, Rob, Rose, Sheila, Steve B, Stewart, Sue, Thomas, Wally and Will. 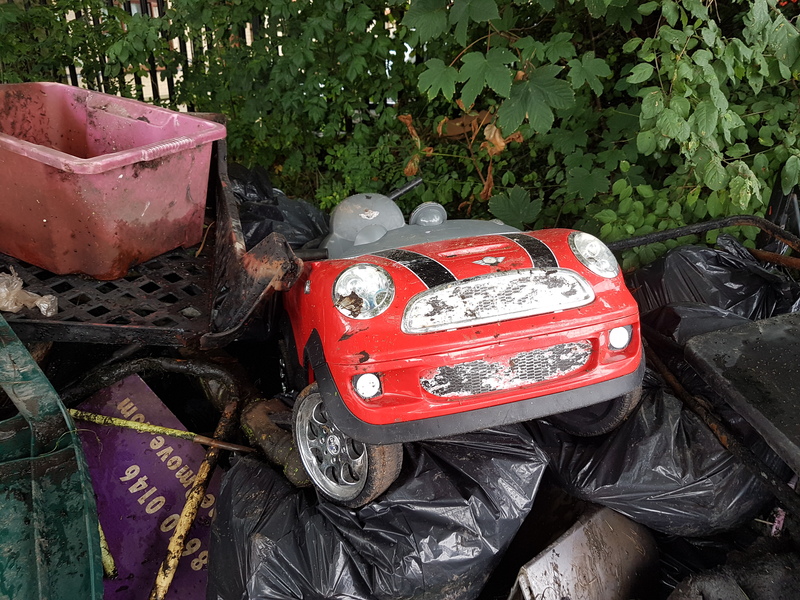 This entry was posted in Uncategorized and tagged Cleanups, Events, Merton, People, Spreading the Wandle Word, Volunteer, Wandle, Waterside Way on September 6, 2017 by Polly. 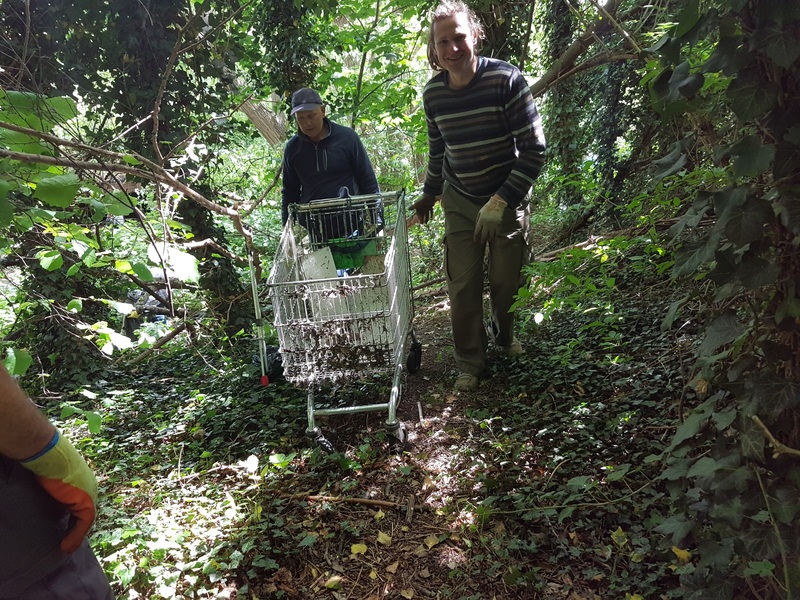 Our July Wandle cleanup saw us heading to a site we hadn’t been to in four years and one month – Goat Road! We set our tent up on Watermead Lane and waited patiently as 48 people gathered round ready for the start of the day. 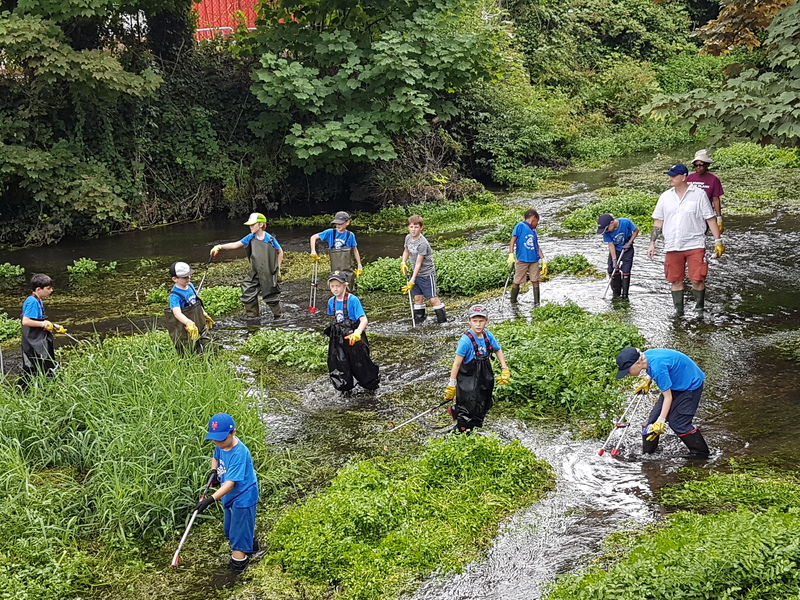 We were joined by around 20 young’uns from 5th Morden Cub Scouts, as well as Gary Hunt, chairman of the CATCH urban river group in Somerset, who also came along to share ideas. So with everyone gathered, I gave my Health & Safety talk and we got started. Our waders headed to tackle the river upstream of Goat Road. 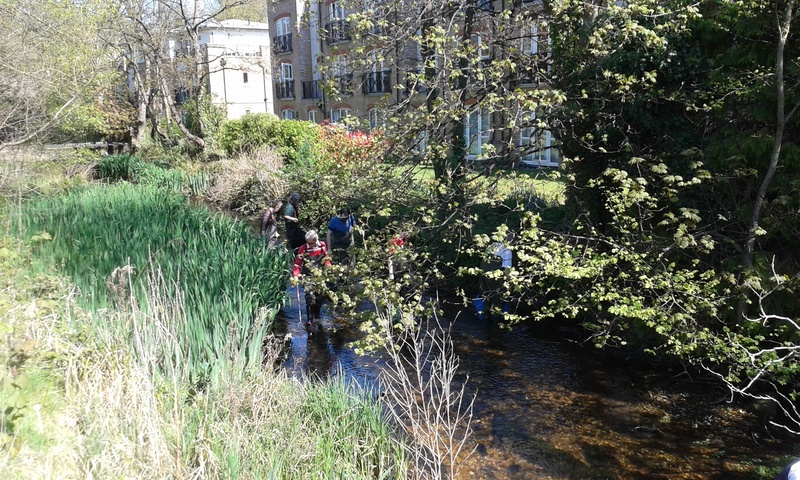 Although this section of river looked beautiful and the perfect chalkstream – it wasn’t long until rubbish was found. A chimney was our first find, but that was soon overshadowed by the rest of the rubbish that was pulled out! Soon the rubbish pile was huge. 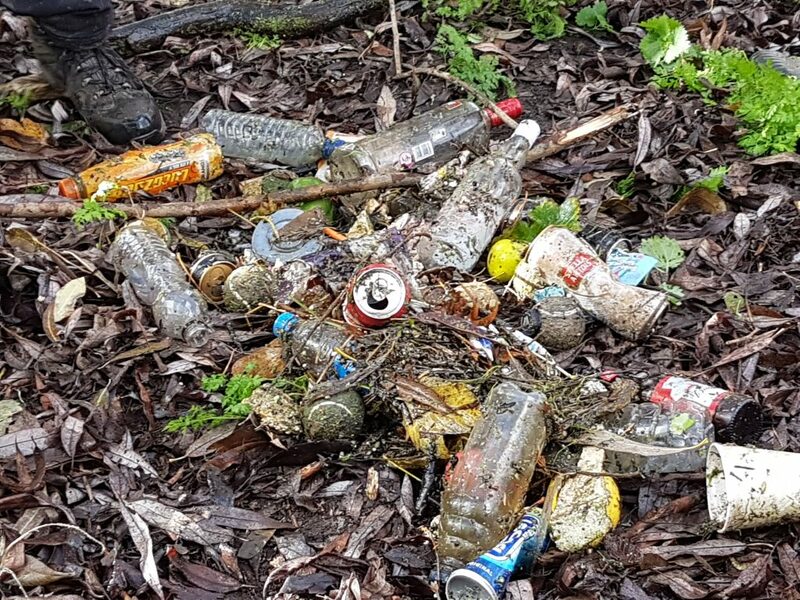 In the undergrowth around the river, and in the smaller channel around the mills, there was a lot of litter too. Luckily we had the scouts on hand to help us! 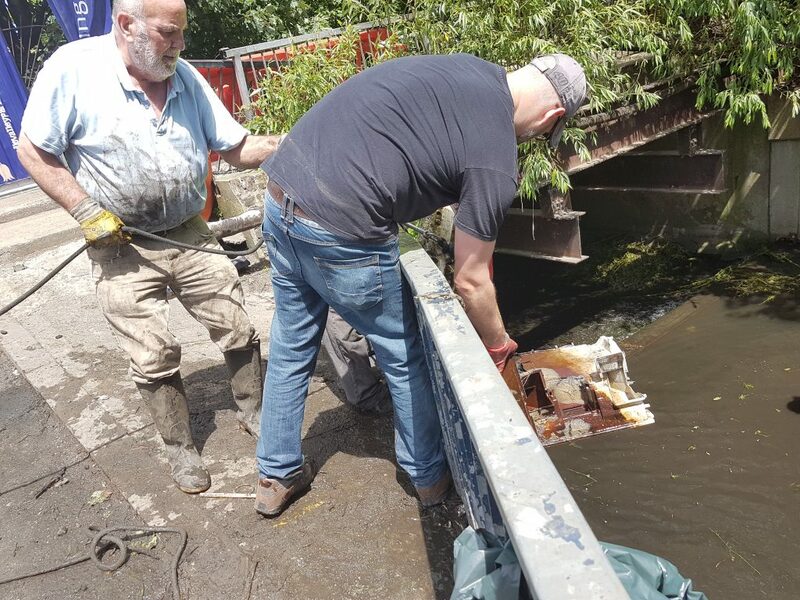 Just before lunch, 10 boxes of rotting salmon were discovered in the side channel and removed by some brave volunteers – the smell lasted all day. We stopped for lunch to have a rest – as it was hard work in the sun. 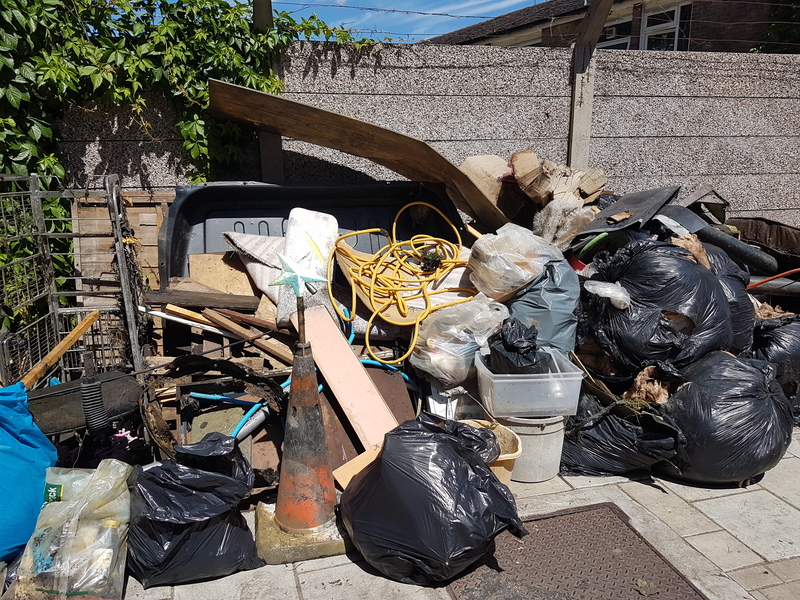 But as always, knowing there was more rubbish to be found, the waders were soon heading up to Buckhurst Avenue for the next session. 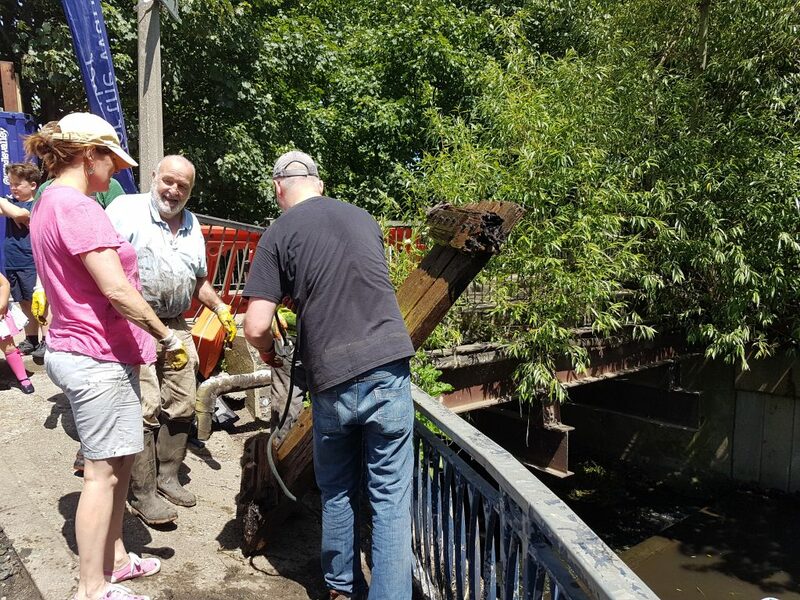 While we waited on the bridge for the waders to emerge from behind the factories on the Buckhurst Avenue stretch, we used the grappling hook to fish out a bicycle we could see in the water. It took a few attempts but we got it in the end. Three trolleys were soon pulled out once the waders arrived. 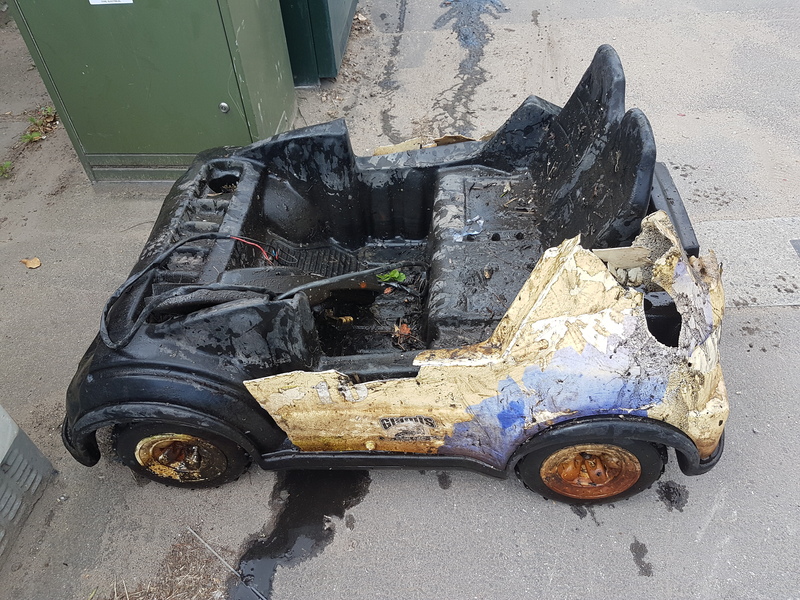 And a burned-out moped was found abandoned in the undergrowth. After a long day we packed up the van and headed home. So what did we find? 1 chimney, 1 go kart, 1 armchair, 1 sofa, 1 computer chair, 1 lawnmower back, 1 moped, 1 manikin arm, 2 golf clubs, 2 rubber ducks, 2 coconuts, 3 traffic cones, 4 trolleys, 4 wooden pallets, 4 bicycles, 10 boxes of rotting salmon, 12 tyres and bags and bags and bags of other rubbish! Huge thanks to local volunteer Jackie for kindly funding this event, everyone who helped unpack and pack up the van during the event, Rosie for supervising the Event Tent and for helping me back at the garage, Sally for baking some treats, Big Yellow Wandsworth for providing free storage space for our equipment and the Parks Team at Sutton Council for organising collection of all the rubbish the next day. Thank you to all our volunteers for coming: Aaron, Ahamefull, Alex, Andy B, Ben, Beth, Bruce, Charles, Chris E, Chris F, CJ, Dave J, David H, Declan, Derek, Edgar, Frank, Freddie, Gary, Geoff, Gillian, Guy, Helen, Irene, Jackie, James B, James E, Jane, Joe, John L, John N, Joshua, Kathy, Kim, Marcus, Martina, Massimo, Mathew, Max, Melanie, Nick, Paul, Per, Phil, Rachel, Rose, Sally, Sheila, Shivani, Steve, Susan, Theo, Wally, Will and Zach. 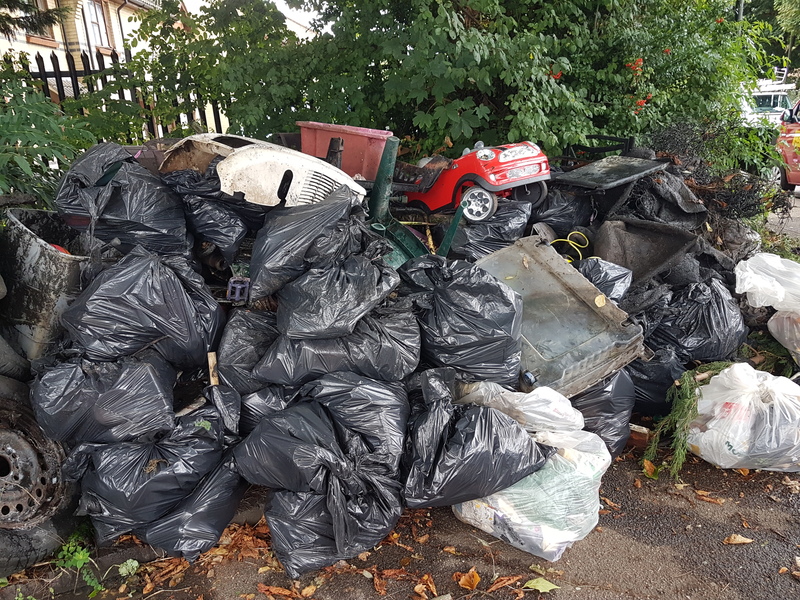 This entry was posted in Uncategorized and tagged Cleanups, Events, Goat Road, People, Spreading the Wandle Word, Sutton, Volunteer, Wandle on August 3, 2017 by Polly. 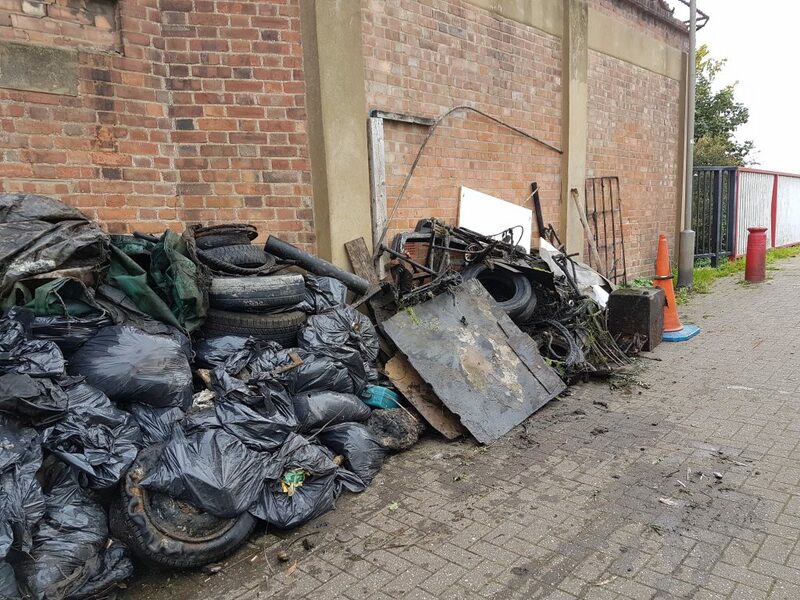 For our Wandle cleanup this month, we answered local pleas to revisit Trewint Street in Earlsfield and clear some recent fly-tipping that had shocked the local neighbours. 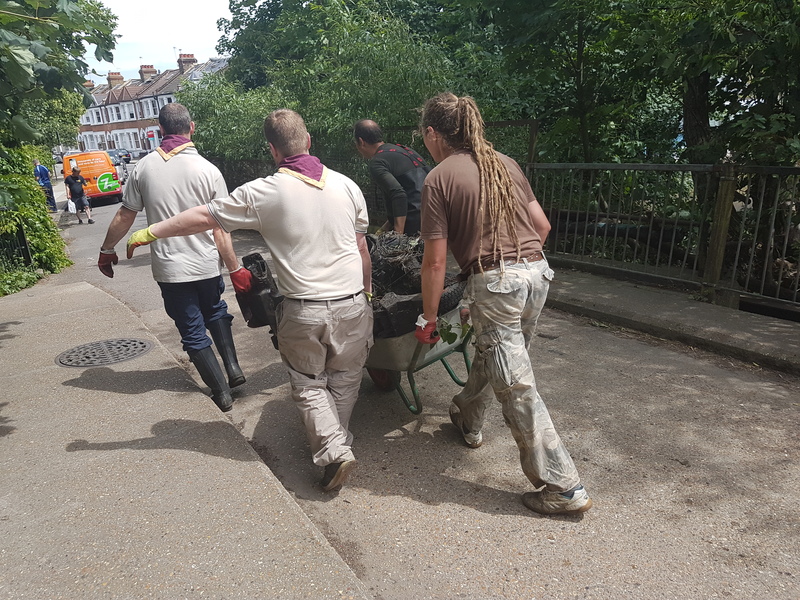 On a sunny Sunday, 59 volunteers joined us at Trewint Street, including 1st Homefield Cub Scouts and the rugby players from Bec Old Boys Club; all ready to get stuck in. Within what felt like two seconds of finishing the Health & Safety briefing, there was already a washing machine being pulled up the concrete bank. It took some considerable muscle and cooperation, but it was safely pulled up and used to start our rubbish pile. After the washing machine, rubbish came flooding in, faster than I could keep track of. 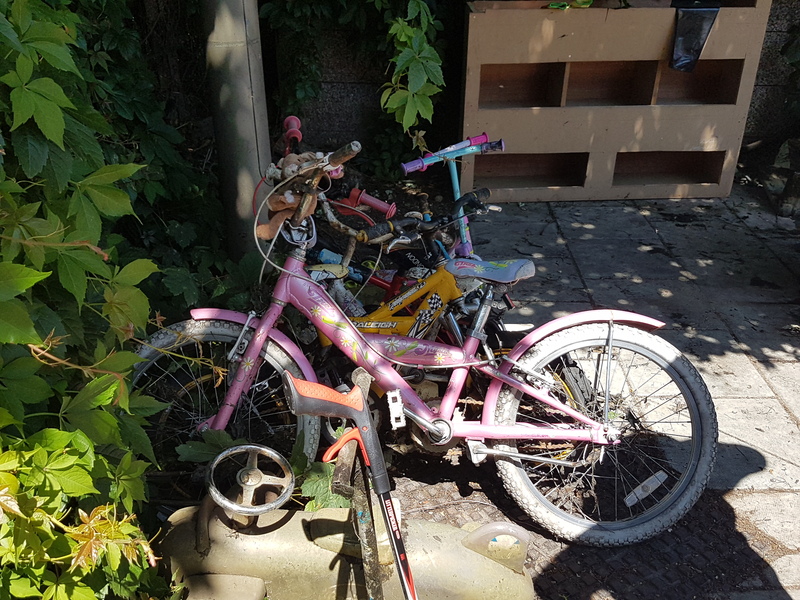 We found several children’s bikes..
…an airplane which is perhaps my favourite find since starting to run cleanups in 2014! Before it was even lunchtime, the rubbish pile was piled high! This wooden structure weighed a considerable amount and walking it upstream under the bridge was a challenge enough, let alone pulling in up the concrete bank. But with sheer dedication and muscle, we prevailed. 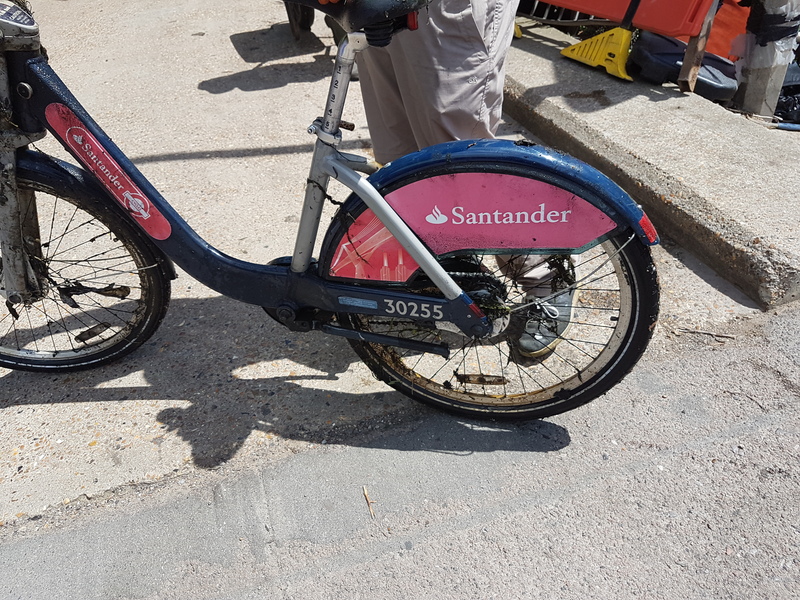 A couple more finds before lunch included a Santander bike by the Homefield Cubs! and half of another washing machine. Having achieved so much in the morning, we decided the afternoon would be shorter. 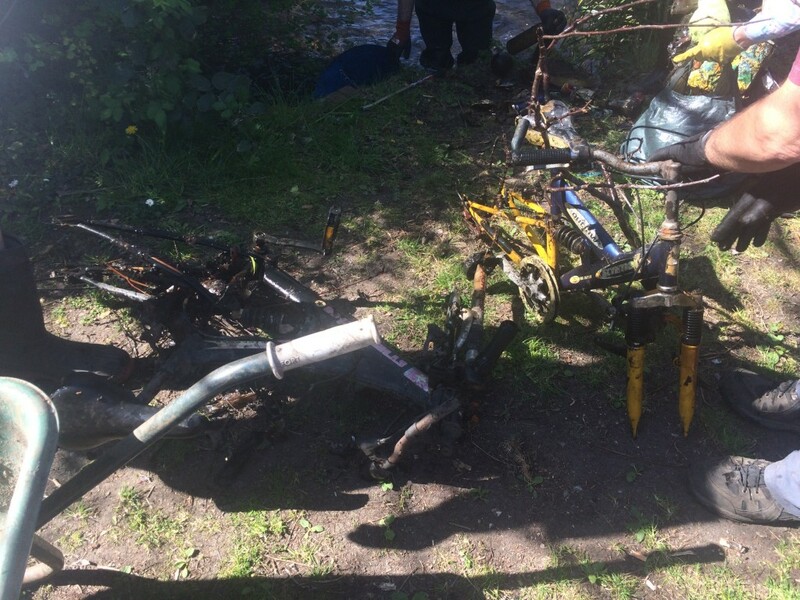 One small team followed the Homefield cubs down the Wandle Trail to a motorbike they had discovered earlier in the morning. Before everyone collapsed with exhaustion, we called it a day. If you looked at the pile though, you would have assumed we had been working for more than just 3 hours! So what did we find? 1 rubber dingy and oars, 1 airplane with wheels, 1 radiator, 1 Santander bike, 1 fan, 1 Thomas the tank engine, 1 dinosaur (now rehomed in Polly’s dinosaur-themed flat), 1 railway structure, 1 washing basket, 1 bunny, 1 wheel clamp, 1.5 washing machines, 2 blankets, 2 mattresses, 2 traffic cones, 2 tyres, 3 motorbikes, 4 children scooters, 5 children’s bikes, 6 buckets, planks and planks of wood (fencing, furniture and more) and bags and bags and bags and bags of rubbish! We also pulled a fair amount of Himalayan balsam – as if we hadn’t worked hard enough! Huge thanks to everyone who helped unpack and pack up the van during the event, Rosie for supervising the Event Tent and for helping me back at the garage, Big Yellow Wandsworth for providing free storage space for our equipment and the Waste Team at Wandsworth Council for organising collection of all the rubbish the next day. Thank you to all our volunteers for coming: Aaron, Abigail, Adrien, Alan, Andrea, Andrew D, Andrew R, Andy, Brody, Carter, Charles, Charlotte, Chris, Claire, Dave, David, Ed B, Ed H, Ed S, Geoff, Guy, Harry, Howard, Ivan, Jason, Joanna, Lisa, Liz, Luca, Lucile, Luke, Lynda, Martina, Maxwell, Michael, Miles, Nick, Nicola, Oliver, Per, Pete, Phil, Richard, Rory, Rose, Sally, Sam, Sarah, Sheila, Stephanie, Steve B, Steve M, Theo, Wally, Will and William. So what did I learn from this month’s cleanup? 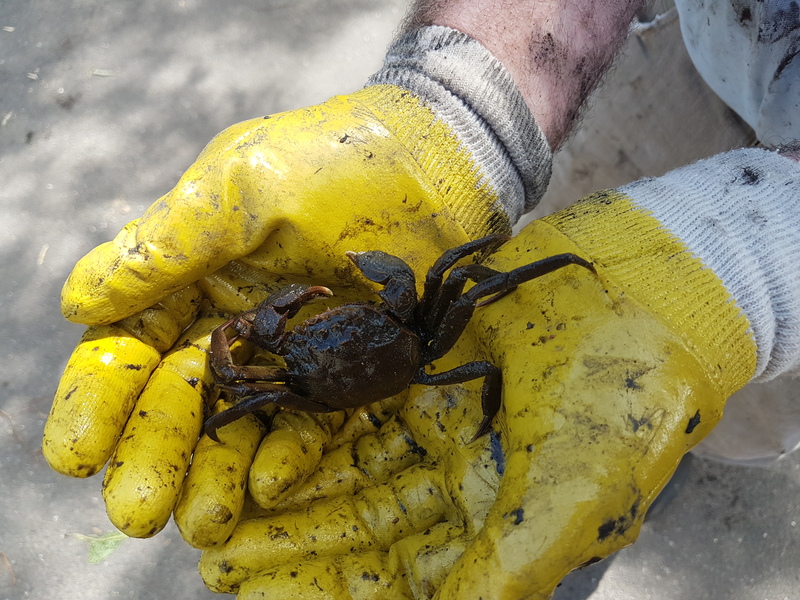 Chinese mitten crabs are living in the Wandle at Trewint Street! 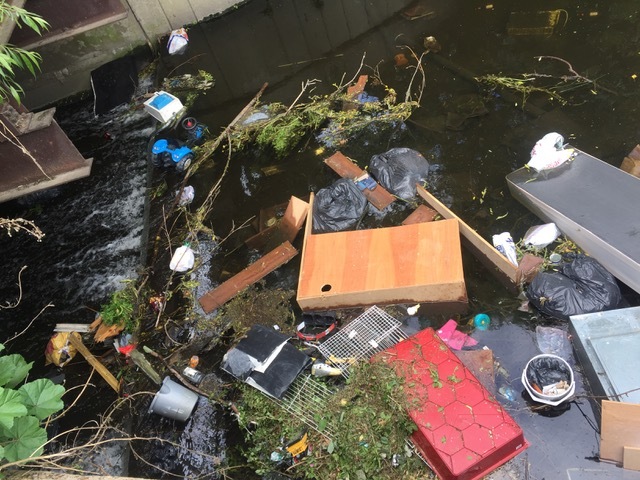 This entry was posted in Uncategorized and tagged Cleanups, Earlsfield, Events, INNS, People, Pollution, Spreading the Wandle Word, Trewint Street, Volunteer, Wandle, Wandsworth on June 13, 2017 by Polly. 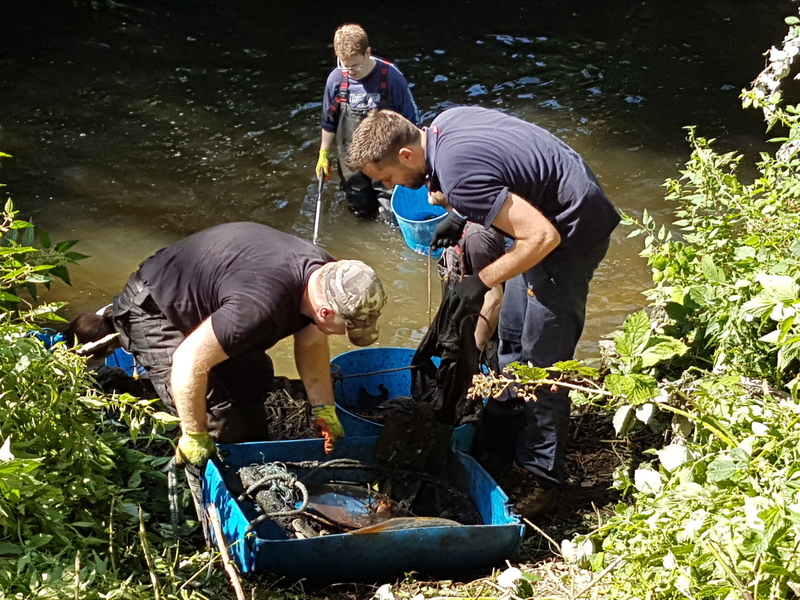 As May is the start of Himalayan balsam season, our cleanup for the month focused on Beddington Park, with our usual volunteers joining forces with our Invasive Non-Native Species (INNS) teams: the River Rangers and the Hit Squad. 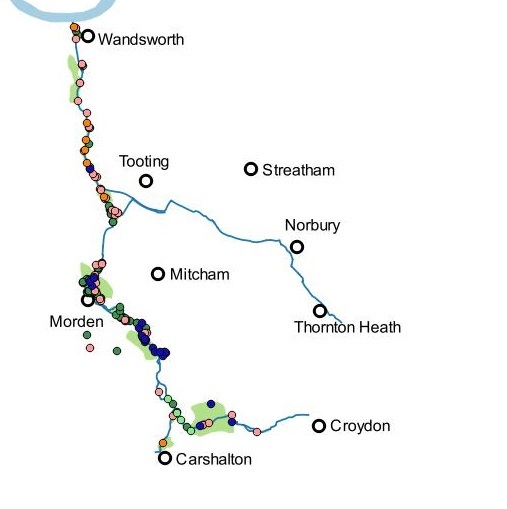 On the Wandle, Himalayan balsam is widespread and is not great news for the river. 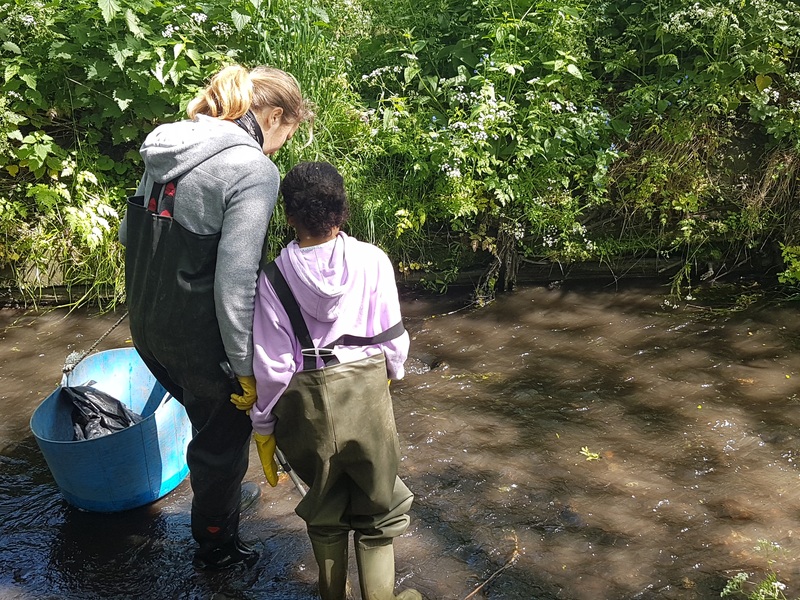 As part of our Wandle Invasive Species Project, we have been working with our River Rangers and Hit Squad to map the distribution of the plant on the river, and plan out action to work towards its eventual eradication. 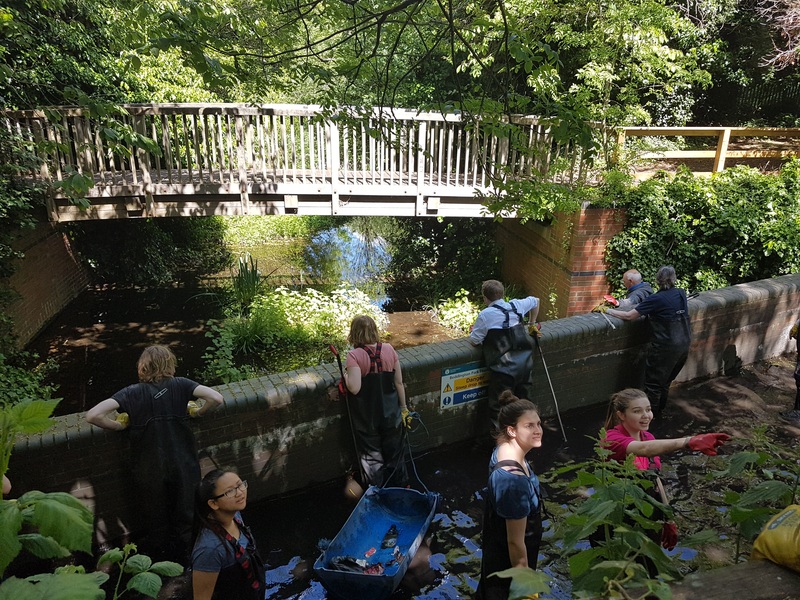 Beddington Park, and Richmond Green just upstream, are considered the “source” of Himalayan Balsam for the Wandle, sending seeds downstream to colonise new sites, and are therefore priority areas to target. On a sunny Sunday morning we were joined by 58 volunteers, including a local scouts group and our INNS Officer, Alan, with his trusty sidekick, Pepper the dog. After our Health & Safety briefing, we divided into two teams to get started: the cleanup crew and the balsam bashers. Alan led the balsam bashers. 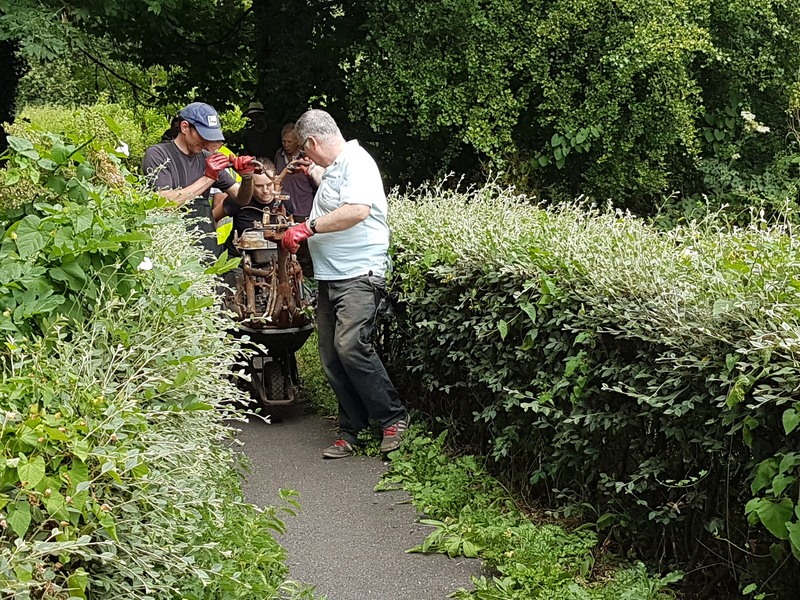 Having worked on the site last year, Alan knew where the balsam would be and took a team of volunteers to remove every single plant. 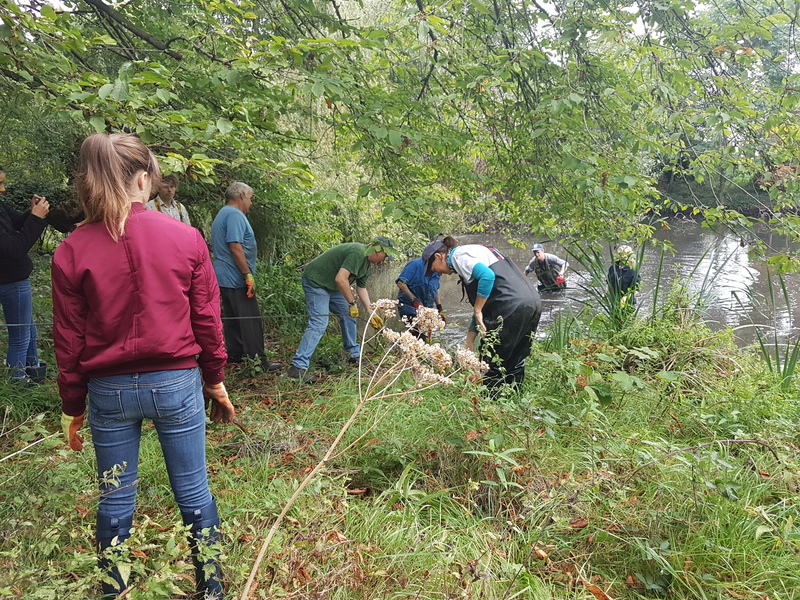 Meanwhile, the cleanup crew got started on the river. The waders headed upstream from Church Lane towards Richmond Green and it wasn’t long until two trolleys were found. And then not much longer until another two were discovered! 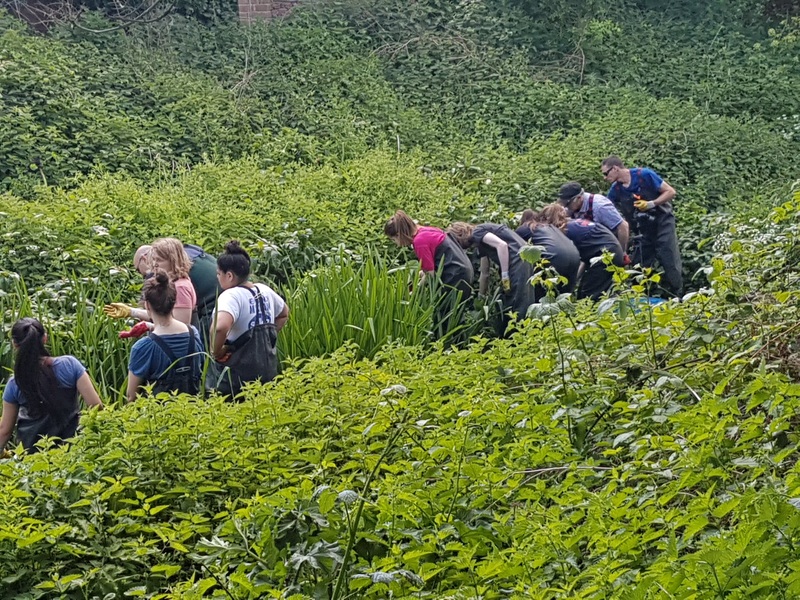 While working up the river, the cleanup crew kept an eye out for any Himalayan balsam growing on the banks of the Wandle, removing each plant as it was discovered. In no time, we had made it to the weir and started emptying the trugs of rubbish into wheelbarrows. 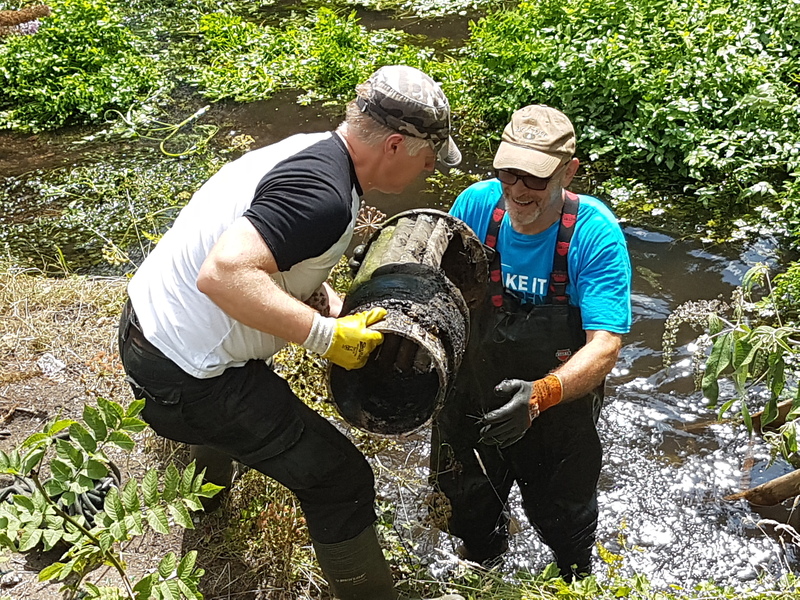 Andy and Dave then led an “expert” team over the weir all the way to Beddington Lane to clean and check for balsam on a stretch we are usually unable to access. We still had 40 minutes until lunch, so the rest of us headed back to the tent, got back in the Wandle and headed the other way to clean the river inside the park. It was close to spotless with only the odd can or bottle! 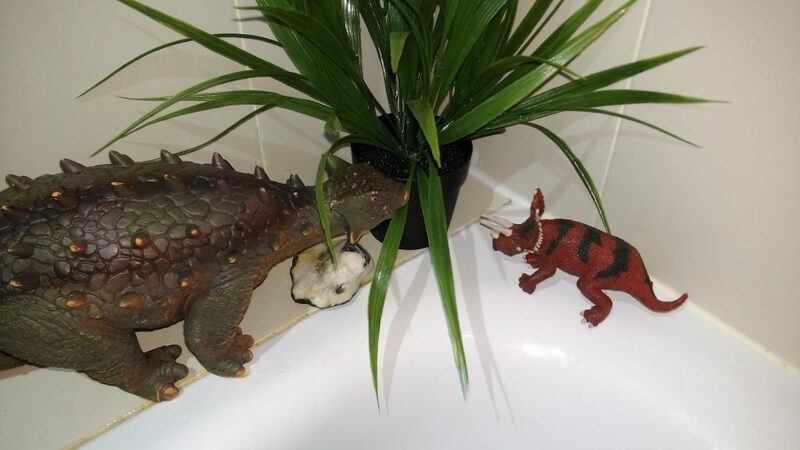 By lunchtime, the balsam team had finished, and the cleanup crew were in need of a drink. We all gathered back at the tent to have lunch and enjoy the sunshine. 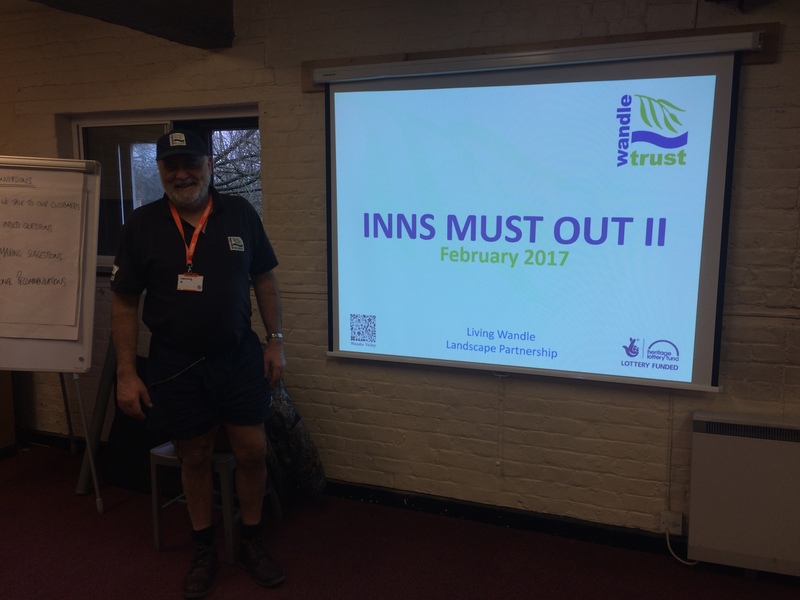 After a longer lunch than usual, Alan took the Hit Squad (our team of volunteers trained in the management of Invasive Non-Native Species) to the small pond on London Road, just outside Beddington Park. 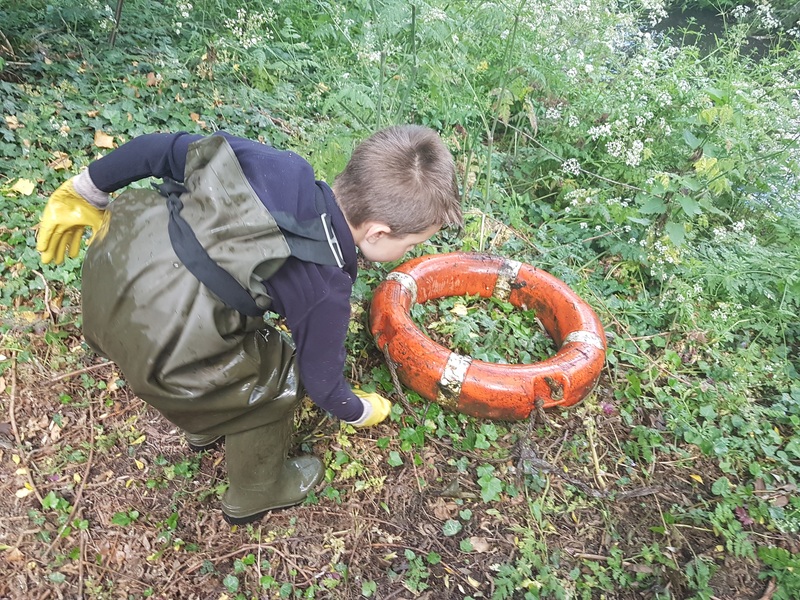 Here there was some floating pennywort to remove as part of the Wandle-wide battle against the very invasive aquatic species. 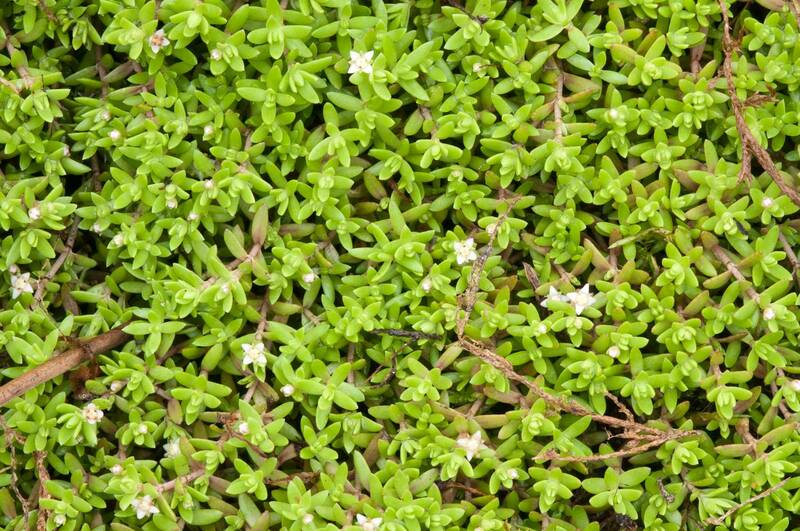 A rather terrifying discovery however, was the presence of New Zealand pigmyweed (Crassula helmsii) in the pond as well – photographs and samples were taken to confirm but this aquatic plant could cause real problems for the Wandle. The rest of the waders got back in the Wandle and finished off the last 100 m in the park, finding an extra 3 or 4 bags of rubbish. It was then time to check the skip was packed, and the van, and then all head home for a nice cold beverage. So what did we find? 1 washing line complete with pegs, 1 car wheel clamp, 1 tow bar, 1 buoy ring, 1 bag of lemons, 1 coffee table, 1 football, 1 tennis ball, 1 cricket ball, 2 traffic cones, 3 coconuts, 4 trolleys and 15 other bags of rubbish, plus around 200 balsam plants. Huge thanks to local volunteer Jackie for kindly funding this event, Sutton Council for purchasing some much needed litter pickers for us, everyone who helped unpack and pack up the van during the event, Rosie for supervising the Event Tent, Rosie and Alan for helping me back at the garage, Ann for baking some treats, Big Yellow Wandsworth for providing free storage space for our equipment and the Parks Team at Sutton Council for organising collection of all the rubbish the next day. Thank you to all our volunteers for coming: Aaron, Aenes, Alex, Andrea, Andy, Andy B, Ann, Cain, Caroline, Charles, Charlie, Chris, Claire, Clare, Dave, David H, David S, Derek, Drew, Ed, Gavin, Geoff, George, Gillian, Guy, Jackie, Jane, Jenny, Jessica, Jim, John L, John N, John S, Joshua, Justyna, Katrina, Ken, Kilian, Kim, Matilda, Michael, Nick, Nicola, Olivia, Per, Phil, Rolanas, Rosie, Sheila, Sophie C, Sophie N, Steve, Talus, Victor, Wally and William. So what did I learn from this month’s cleanup? The difference between coconut water and coconut milk! 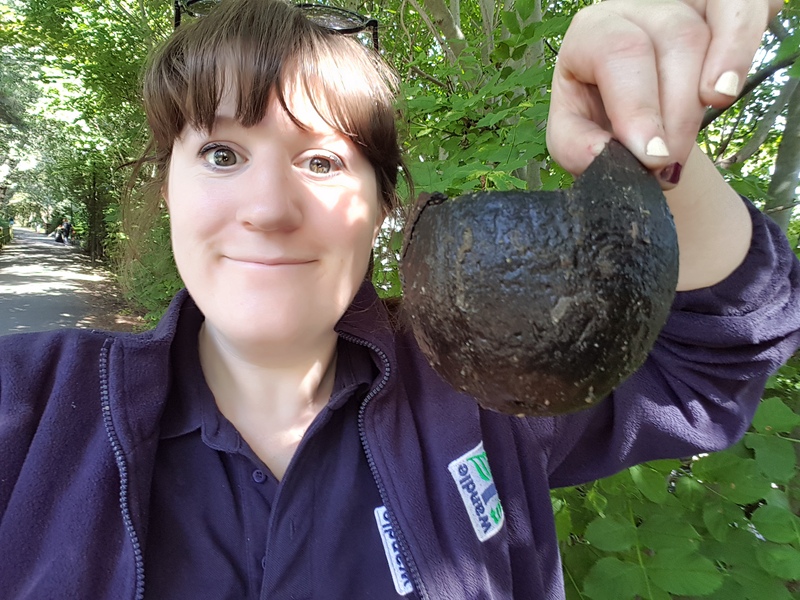 This entry was posted in Uncategorized and tagged Beddington, Cleanups, Events, floating pennywort, Himalayan balsam, INNS, invasive species, New Zealand Pigmyweed, Spreading the Wandle Word, Volunteer, Wandle on May 19, 2017 by Polly. 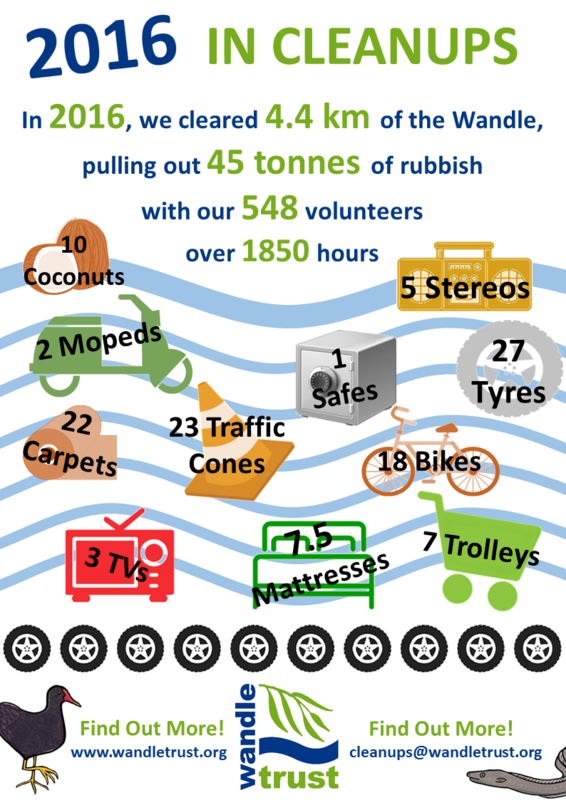 The organisation of our April cleanup was big as we had grand ambitions. 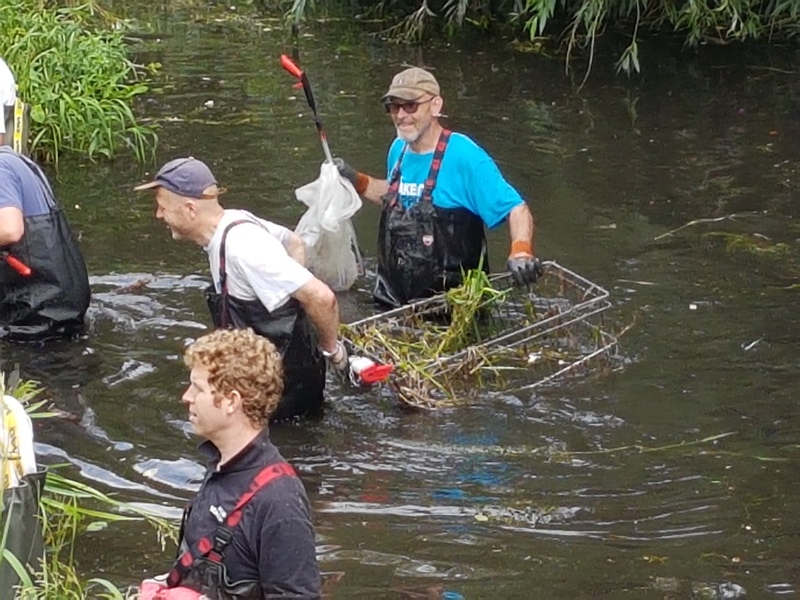 We aimed to clean the river from Grove Park, all the way to the top of Culvers Island, covering over 2000 m of the Wandle. To achieve this we needed a large number of volunteers. 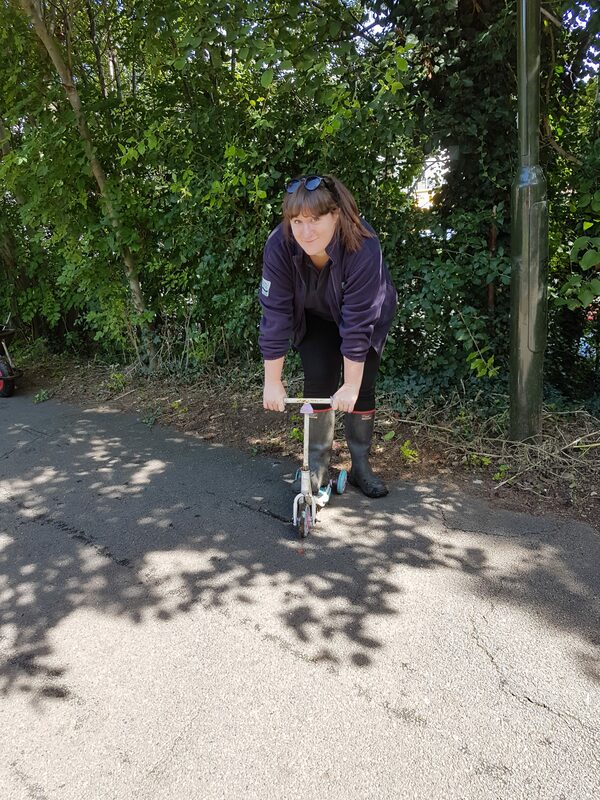 Luckily, we were gifted with sunny weather, and with a local 50th birthday joining us, we were not disappointed as 50 people met us at Hackbridge Road Bridge. To tackle the 2000 m we divided into two teams, one led by Andy, and the other by Theo. After the Health & Safety briefing, and division of equipment, the two teams set off. 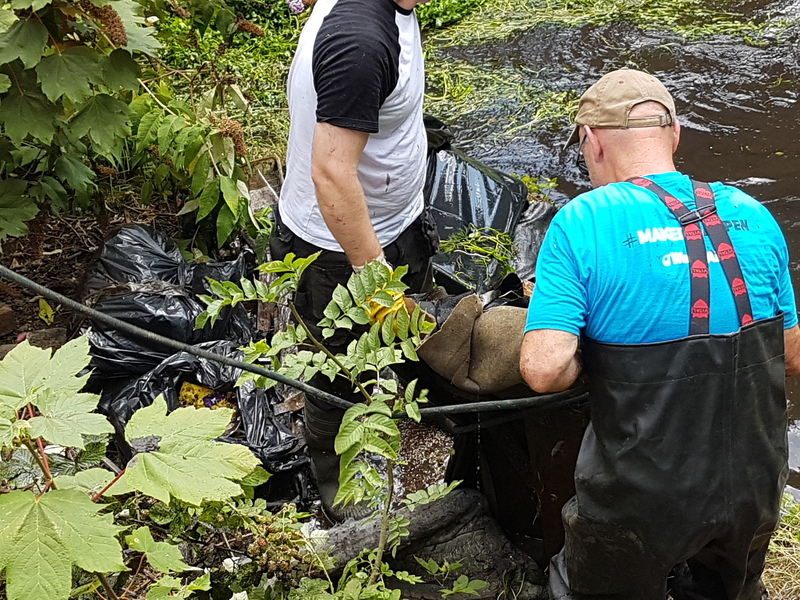 Andy’s team headed down the Wandle to the northern end of Culvers Island and started working up the right hand branch of the river. To start with, rubbish was slow to find and our people wading made quick progress. 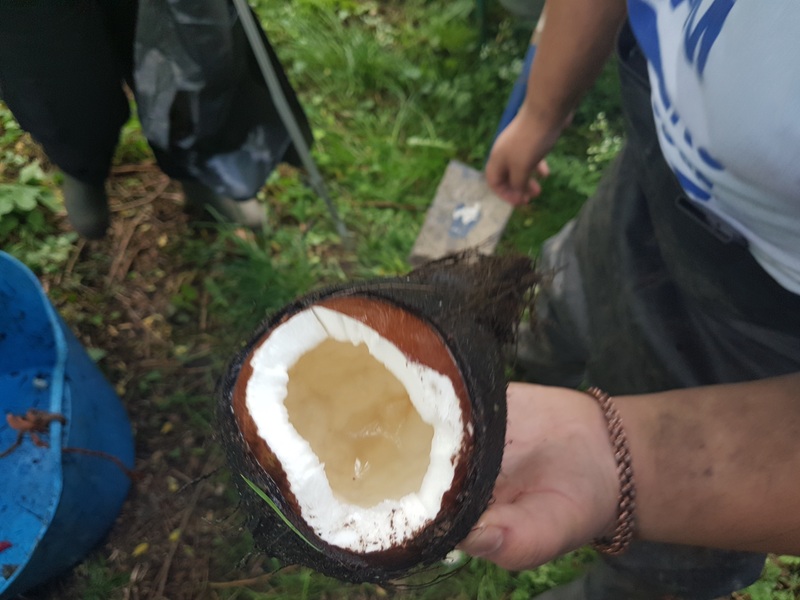 The token coconut was retrieved from the river, along with 3 bike frames with the wheels missing. In no time, the team were at the halfway point at Culvers Avenue. Here, a large pile of fly tipped rubbish was spotted on the other side of the river. 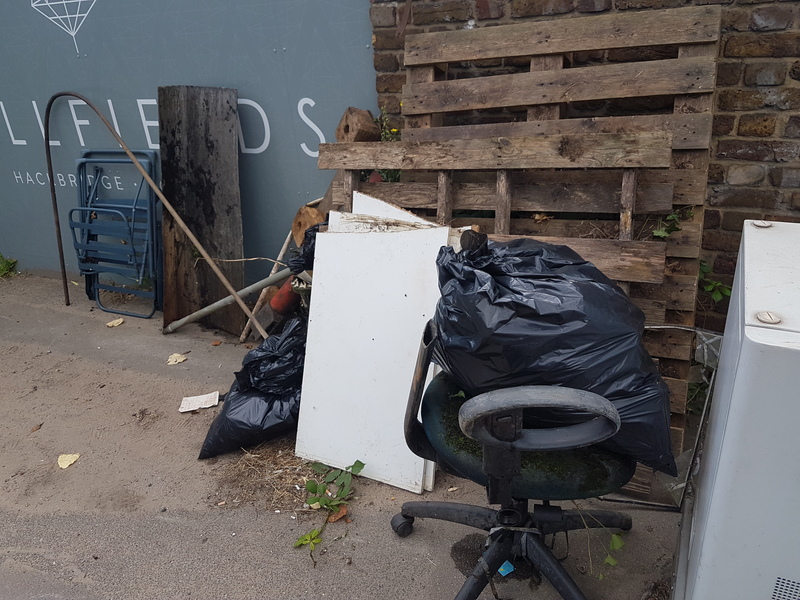 Given we had the luxury of numbers, and we didn’t want the rubbish to end up in the Wandle, we got started moving the pile to our agreed collection site. 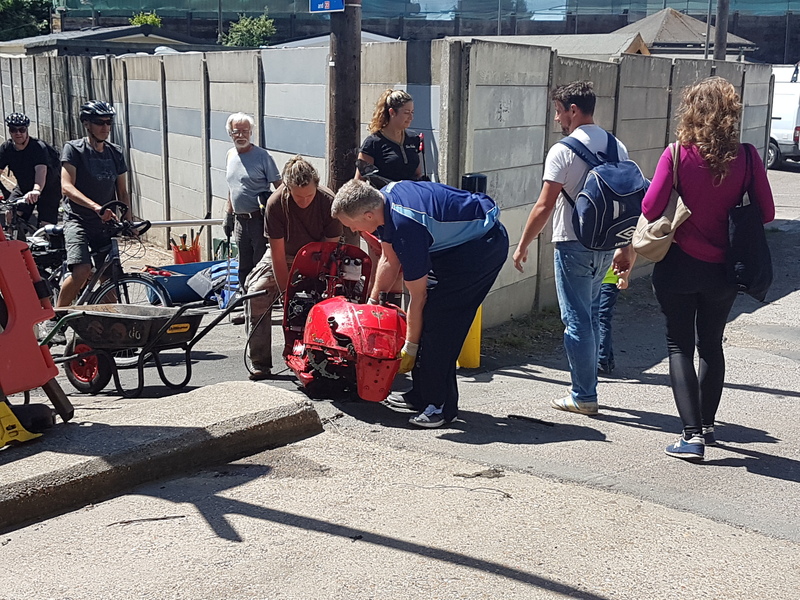 Local neighbours were so happy to see the fly tipped rubbish removed, they came out and gave us ice cold drinks and bottles of water as a thank you – given the heat of the day this was much appreciated! With the tip removed, we got back in the river and headed towards the lunch site at Hackbridge Bridge. 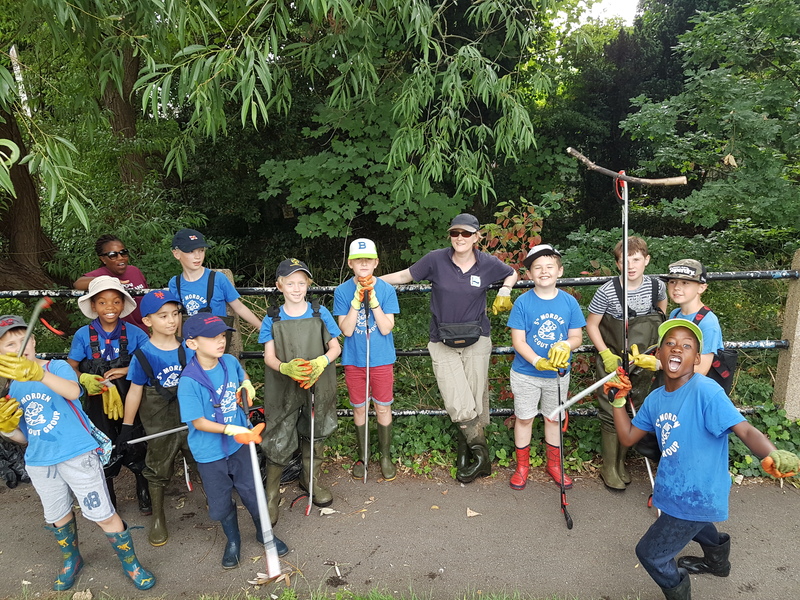 Meanwhile, Theo’s team had been working hard on the Carshalton arm of the river. 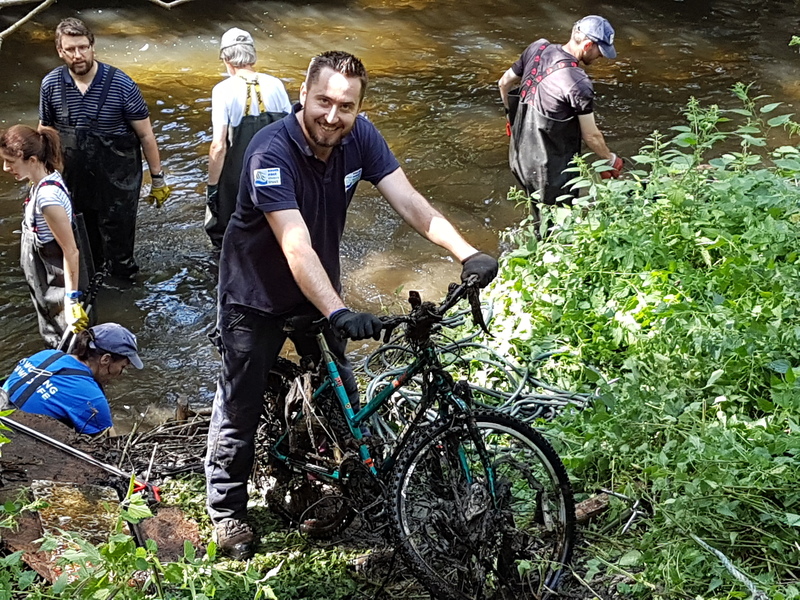 Helped by Derek and other volunteers from London Wildlife Trust’s Wilderness Island nature reserve, we worked steadily upstream, clearing litter from the dragons’ teeth and other habitat features which we’d previously installed in this stretch. By lunch time we were all gasping for a drink so we reunited at the event tent where Rosie had water, squash and cake ready for us. As it was Clare’s 50th, we were also treated to extra food including strawberries, grapes and Easter cakes baked by the students from Richmond University. After re-fuelling, the teams headed out again to finish what they had started. Andy’s team headed back to the north of Culvers Island to tackle the left hand side of the river while Theo’s team got back in at Butter Hill to continue up to Grove Park. 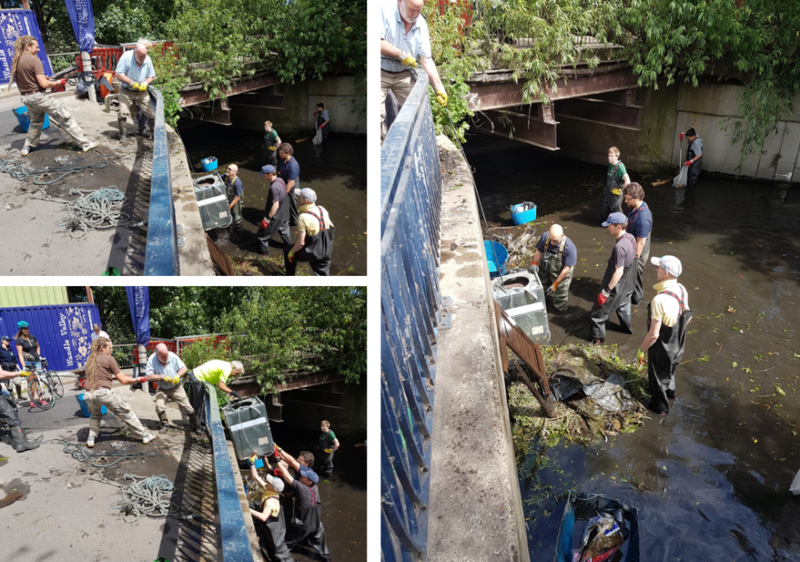 It was a huge effort from all and we hope we left the Wandle in Sutton a little clearer and rubbish free. 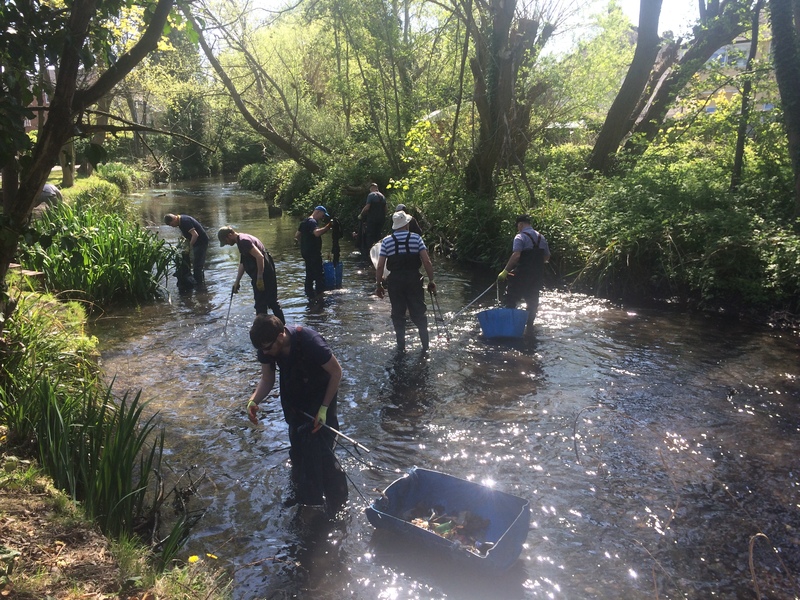 The next Wandle Cleanup will be on Sunday 14th May in Beddington Park where we will also be tackling Himayalan balsam! So what did we find? 1 golf ball, 1 bike wheel, 1 sun hat, 1 flat pack wardrobe, 1 flat pack chest of drawers, 1 large section of roofing felt, 1 window, 1 hoover, 1 scooter, 1 traffic cone, 1 mobile phone, 1 bouncing ball, 1 concrete bathroom wall (we think), 1 umbrella, 3 bikes with wheels intact, 2.5 coconuts, 3 bike frames without wheels, 4 guttering pieces, half of a plastic Christmas tree, bags and bags of rubble from the fly tip and bags and bags of cans, bottles and other rubbish. Huge thanks to everyone who helped unpack and pack up the van during the event, Rosie for supervising the Event Tent and helping me back at the garage, the students from Richmond University for baking some treats, Big Yellow Wandsworth for providing free storage space for our equipment and the Waste Team at Sutton Council for organising collection of all the rubbish the next day. Thank you to all our volunteers for coming: Aaron, Andy, Ann, Charles, Chris, Claire, Dave, David, Derek C, Derek P, Doris, Ed, Guy, Jackie, John N, John S, Mike, Phil, Sally, Steve, Stewart, Theo, Trevor, Victor and Wally. The sign in sheet from this event has gone missing in the garage so if you joined us and don’t see your name above, please let us know so we can add you! 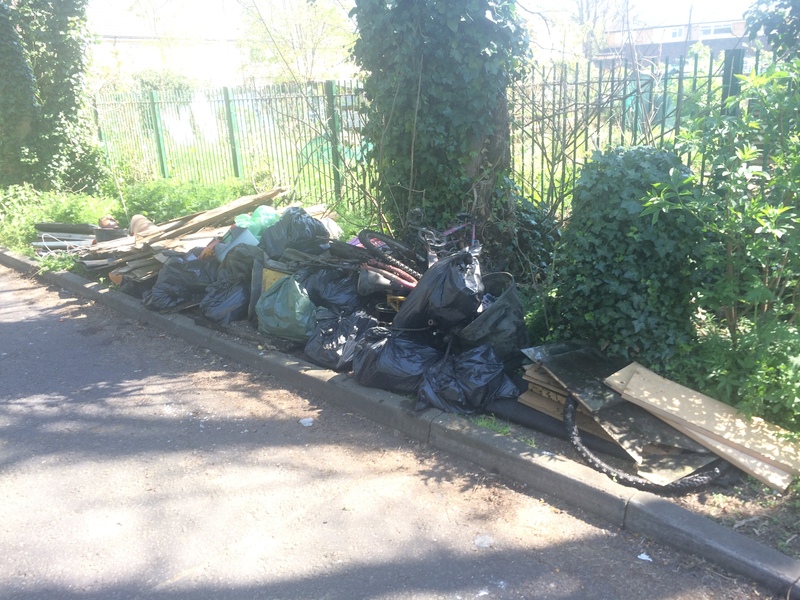 You can comment here or email cleanups@wandletrust.org. So what did I learn from this month’s cleanup? That people really do appreciate what we do – and thank us with ice cold drinks! 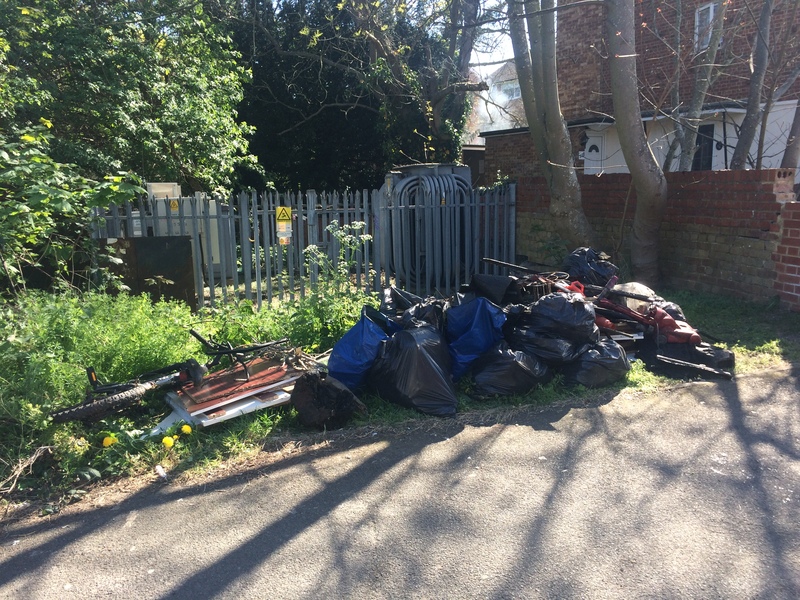 This entry was posted in Uncategorized and tagged Carshalton, Cleanups, Culvers Avenue, Events, Hackbridge, People, Spreading the Wandle Word, Sutton, Volunteer, Wandle on April 24, 2017 by Polly.